146 Search Results for "#"
Boss: In today's "lessons learned" meeting, I would like to hear the team's thoughts on the reasons for our project failure. Dev, what do you have to say? Dev: My short answer is, "We should not have accepted unrealistic deadlines for a complex project like this." Boss: Dev, are you trying to throw shade at me? Dev: Nope! In fact, all through the project, we have seen enough through rose-colored shades. I thought it was time to throw some light on the ground realties. Flawed estimates mean missing deadlines and exceeding budgets. There are a number of estimation techniques to choose from viz. analogous estimating, parametric estimating, data analysis techniques, etc. Knowing the techniques and learning how to use them well is how you become better at estimating. Dev : Boss, I just read your email. You have assigned me to an under-funded project with unreasonable timelines. Dev : And to top it all, you have assigned junior resources to work with me. Boss : It is often said that necessity is the mother of invention, Dev. Boss : So instead of fussing so much, why don't you look at it as a glass half full rather than half empty! Boss : Creativity thrives best when we are constrained. Boss : These challenges can actually work as assets to fuel your team's creativity. And then you can use so many easily implementable techniques to overcome these constraints. There are many techniques a project manager can use to enhance creativity or solve problems. Some of the popular ones are Brainstorming, Nominal group technique, Idea/mind mapping, Affinity diagramming, Force field analysis, Cause and effect diagramming, SWOT analysis and Root cause analysis. Dev : Boss, my team has been using an outdated collaborative tool for a long time now. It is eating into their valuable project time. Dev : They complain that they cannot easily find the critical project documents and eventually waste time looking for project assets. Dev : Boss, I suggest we buy this new cloud-based management tool which has received great reviews from the industry and peers. It will save the team's time on routine tasks and also will be a quick win for them. Boss : Dev have you heard the saying, "A poor craftsman blames his tools"? My quick thought on this 'quick win' ...It is a sheer waste of money! Dev : With his quick as a flash thinking we will surely get nowhere fast. Quick wins are those that will stop wasting your resources and have more impact on your project with less effort. using quick wins on your project and team will get everyone motivated, increase the momentum of the project, and last but not the least will create a feel-good factor because of positive energy created from achievement. Dev : I have been noticing that the team spirit has been on the wane and performance is not up to the mark. Do you think I need improvement in my leadership skills? Boss, I seriously need your advice. Boss : Dev, you need to practice servant leadership with your team members. Dev : And what's that? Boss : Servant leadership focusses on service to others. Servant leaders give up power and deputize others to lead. They lead with team members in mind. Dev : Yes, I got it! Boss : Dev, what on earth are you doing? Dev : I am just practicing being a servant leader ...he is a servant first, isn't he? Swami has been working hard on the project so I am helping him the best way I can. 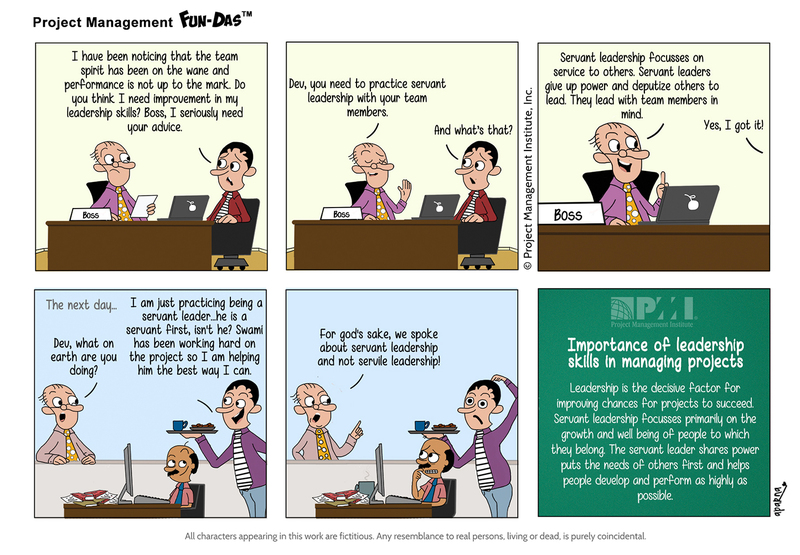 Boss : for god's sake, we spoke about servant leadership and not servile leadership! Leadership is the decisive factor for improving chances for projects to succeed. Servant leadership focusses primarily on the growth and well being of people to which they belong. The servant leader shares power puts the needs of others first and helps people develop and perform as highly as possible. Dev : ..if we don’t take any corrective action Immediately. What do we do? Boss : I have heard of Fast tracking and Crashing as schedule compression techniques…why don’t you try those? Dev : But Boss, both techniques involve risks and also additional costs. Boss : Have you come seeking my advice or tell me your “expert advice”? Dev : Fast tracking could sidetrack the core issue and use of Crashing to compress schedule could ‘crash’ my project. What do I do? Both Crashing and Fast tracking are two techniques to be used as a last resort for performing schedule compression. Fast tracking involves the performance of activities in parallel, whereas Crashing involves additional resources to the project. However, there are potential increased costs and risks in both techniques that need to be taken into consideration before opting for any one of the two methods. Boss: Team, thanks for being here on short notice. I called this kick-off meeting to start work on our new project plan. Dev: But Boss, Jay our lead developer for this project is on leave. His input and presence in today's meeting is much required. Could we schedule this meeting for later? Boss: Oh! Did I miss telling you all that I will be on vacation in the wild jungles of Africa in the coming days? And contacting me would be difficult, So let's wrap up the meeting today without Jay and his inputs. Dev: Without Jay in the meeting, he will surely be walking on the wild side even after he comes back from vacation. Collect Requirements is an essential part of any project and project management. It is the process of determining, documenting, and managing stakeholder needs and requirements to meet objectives. The key benefit of this process is that it provides the basis for defining the product scope and project scope. Dev: Boss, this is the project management plan for our new project. I have outlined how the project will be executed, monitored and controlled, and closed. Boss: The overall plan looks a little confusing. What's with the little red call-outs in between? Dev: Oh, that's me raising the red flag. Once the plan is baselined and has to get updated due to the ever-changing project environment, a reminder that the plan can be changed only through perform Integrated Change Control process. In the plan, it is necessary to define at least the project references for scope, time, and cost, so that the project execution can be measured and compared and performance can be managed. Before the baselines are defined, the plan can be updated as many times as necessary. 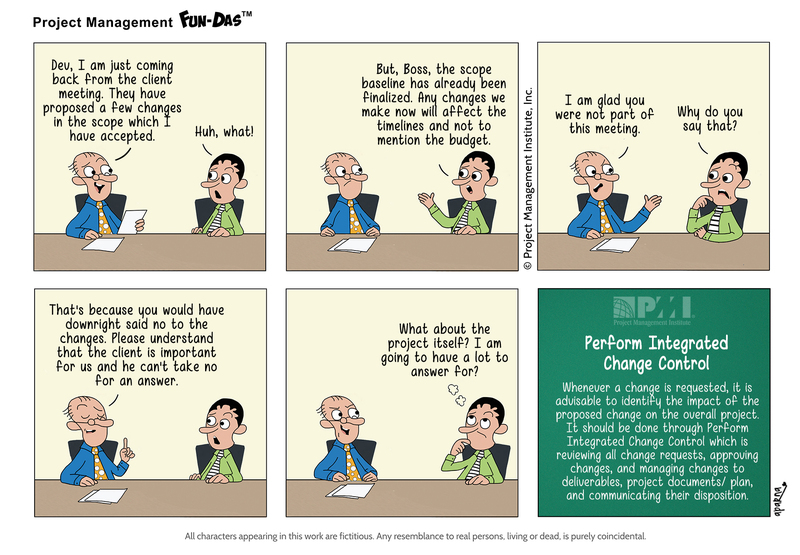 But once baselined, it may only be changed through the perform Integrated Change Control process. Dev: Oh, what a week it has been. Just managed to finish my task on the inventory schedule. Swami: What? I was also working on the same schedule. Dev: Boss assigned me to work on this because of my technical expertise. Swami: And Boss assigned me this as I am a smart worker. Maya: Excuse me friends! You could be heard loud and clear outside the cafeteria! What's the bone of contention if I may ask? Maya: Now that's puzzling. Can one of you please elaborate? Swami: Coincidently, both of us have worked on the same schedule of inventory. Maya: Good Lord! Inventory schedule...even I was asked to work on the same. One of the critical roles of a project manager involves planning and organising the resources in an effective and economical manner for e.g. RACI chart,to successfully complete projects. Boss: Dev, I am assigning you to a new project on Artificial Intelligence (AI) It's a first for us hence quite crucial and prestigious as well. Boss: Good news is, the project is well-Funded and we have a fairly comfortable deadline to complete the project. Dev: Boss, we do not have skilled professionals in the team to hand an AI project. Getting the right people on board will take time as these skills are not easily available. This is your chance to showcase your people and technical skills, pull off a seemingly challenging AI project and get visibility. Dev (thinking): Forget AI skills, I wish common in people. Dev: Maya, this is not what I wanted in my presentation. Didn't you read my mail properly? But the words were beyond my comprehension. I finally gave up trying and put data as per my understanding. Dev: why didn't you just reach out to me for clarification? Maya: you were traveling. And I did email you and tried calling you but your automated reply said, "I am out of office. For urgent matters, Paul will assist" I am not sure who Paul is. As part of communication Process, the sender is responsible for the transmission of the message ensuring the information being communicated is clear and complete and confirming the communication is correctly understood. The receiver is responsible for ensuring that the information is received in its entirety, and understood correctly and acknowledged or responded to appropriately. Boss: Lisa, can you suggest something to boost the motivation levels of our team members. Lisa: I know just the right thing to do! A couple of weeks later..
Boss: Lisa, those inspirational posters are not having the desired effect. In fact, most team members have started sleeping on the job rather than feeling motivated to work hard Any idea why? Lisa: I think they have taken this particular poster rather seriously. The level of motivation an individual and/or team applies to project efforts can affect all aspects of project results. Hence, a project leader should create an environment conducive to outstanding team synergy and peak individual performance. Dev: Swami, I just completed your performance review. Well, you are great at technical skills, however, you need to improve on your leadership skills. That is what is affecting the project outcomes. What do you say? Swami: I think I will keep sharpening my technical skills to the extent that I won't need to depend on my leadership skills to improve results. While technical skills are core to project management, companies are seeking added skills in leadership and business intelligence - competencies that can support longer range strategic objectives that contribute to the bottomline. Boss: Team, sorry to interrupt you during lunch but I have some good news to share which is incidentally related to your lunch. Dev: Lunch? Wow, I can hardly wait to hear it out! Boss: The management has finally approved the training on digital-age skills which the project team had requested. However, it can be scheduled only during lunch hours as we cannot afford to affect our project timeline. Dev: Why is the good news so hard to digest suddenly? In today's increasingly complex and competitive global marketplace, companies must invest in training in competencies that can support longer-range strategic objectives that contribute to the bottom line. While doing so, the management should also ensure the project team is highly motivated to accomplish the goals of the organization. Dev: He is busy writing Test Cases, System and User documentation. Swami: Let me take a guess. His project been picked up for an audit. Right? Periodic audits of the project management process ensure that systemic flaws are identified and fixed and the process is improved. Every aspect of the project management life cycle can introduce problems if not done properly, therefore it must be reviewed thoroughly. Project audits can help identify when a project is about to go off the course. Boss: Just keep me in the loop for all the decisions and provide daily status updates. Just being the hands-on manager you see! Dev: Correction. You mean Micro-manager! 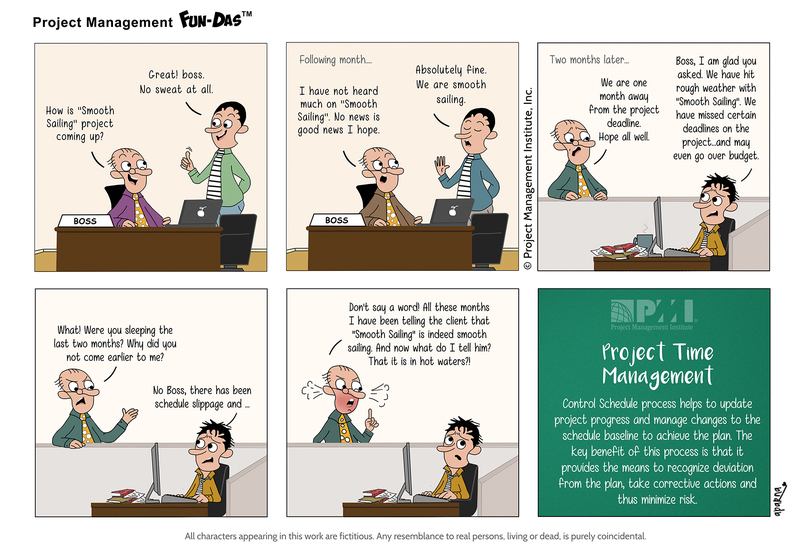 Micromanagement is the ultimate controlling management style. 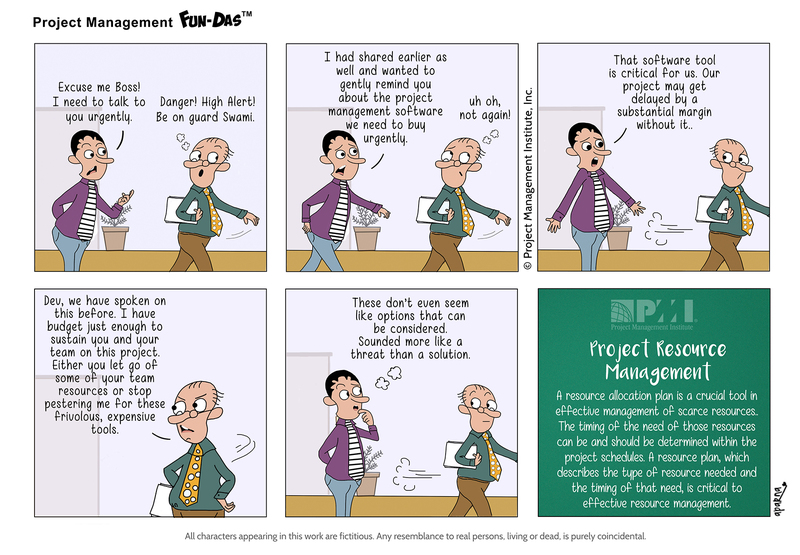 It is not only frustrating for the project manager but also completely undermines their authority. Every relationship demands respect, so it is important to establish appropriate and productive relationships with your manager. Dev: Heard about your recent adventurous trip. And you did bungee jumping and stuff....Weren't you scared doing all these! Maya: Of course not! Fear does not exist in my dictionary, you see. Boss: Hey Maya, a quick reminder! you have a client visit this afternoon for requirements gathering. Yes the same client who keeps changing the requirements at the drop of a hat! Maya: Now That's something I am terribly afraid of! One of the most difficult phases of the project is gathering business requirements from stakeholders. Indecisive clients can be a huge stress. Before being baselined, requirements need to be unambiguous, complete, consistent and acceptable to key stakeholders. This ensures that the client is specific with their requirements, as well as helps to keep the project on track. Maya: Swami, don't you think the way our meetings are conducted is a complete waste of time. Swami: Do you think so? Because I don't remember wasting my time ever in these meetings! Swami: I work on my emails during the parts of the meeting where my presence in the room is completely inconsequential. For meetings to be productive, set and follow a clearly defined meeting agenda, set strict time limits, and ensure that everyone is contributing and sharing their views. Also, more importantly, ensure that the right people are in attendance to accomplish the objectives. Maya: I am so excited. We have successfully completed our project within time and budget. Also, as per given scope. Dev: Congrats, that's a great achievement. That would mean the project benefits also aligned with the organization's strategic goals? Maya: Umm...well...err...Never thought about it. We have moved on to a new project already. 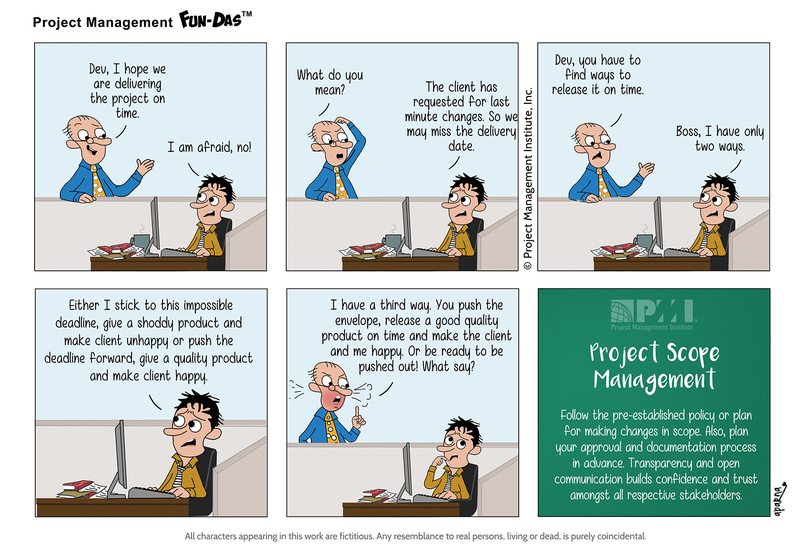 All strategic change in an organization happens through project & program management. And organizations leave that strategy to chance if they do not focus on benefits realization. It is important to create dedicated space for dialogue among C-suite executives, business owners, & project managers right from the start of each project to secure alignment with organization's overarching strategy, assess projects, & course-correct as needed. Boss: Dev, the board has decided to advance the project launch date by four weeks. But the project scope remains the same. Dev: Oh! But Boss, why are we advancing the project deadline? Boss: I don't know. The reason is immaterial now. 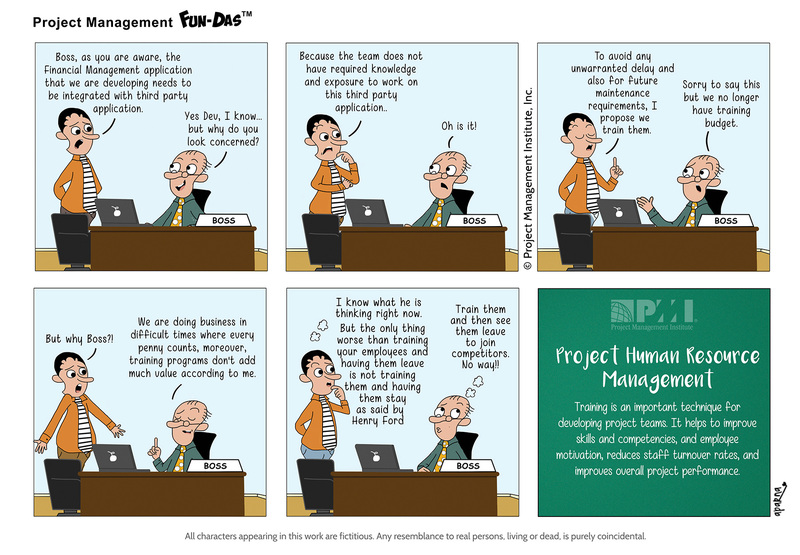 You are the project leader, go figure out how to complete the project in time. 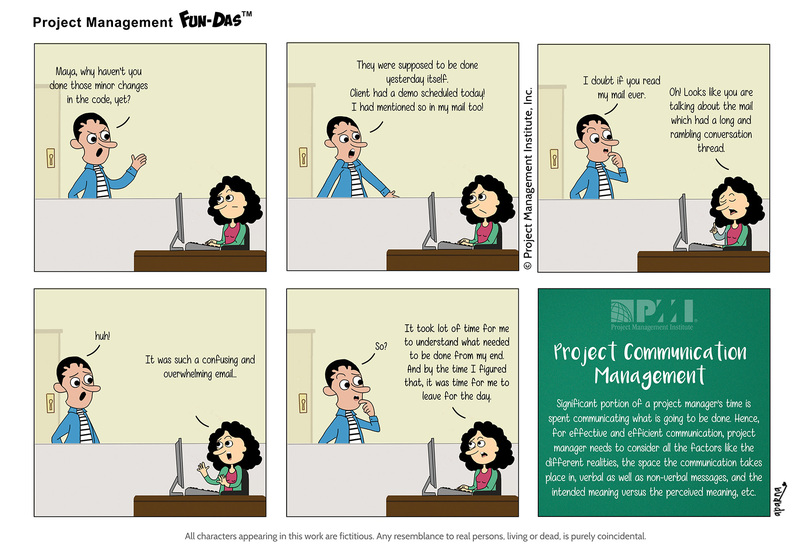 Effective communication helps the project manager to express fears about the challenges surrounding the project. They can either negotiate for a deadline extension or request for other factors for eg. change in scope. The project manager also needs to seek adequate information from the decision makers about the deadline so that he can decipher if the deadline was born out of necessity or if it is just in a bid to drive the team into efficiency. Maya: Hey Swami, I have been reviewing your code since morning. I am just not able to crack it. Also there seem to be extra lines in the code. What are those for? Swami: Well, I have no idea why those extra code lines are in there for. I just copied Jay's code. But all I know is if I remove those lines, the whole application may crash. While acquiring the project team, it is important to use a multi-criteria decision analysis tool to verify whether the team member has relevant experience, competencies, knowledge, skill, and abilities as required for the project. Boss: No ifs and buts, Dev. Stop putting a negative spin on everything I say. Learn to be positive. Boss: Now that's what I call having a good positive perspective. Dev (thinking): And that's what I call being short-sighted and having unrealistic vision! Most Project timelines do eventually slip due to the unrealistic "initial deadlines". Project Managers can take care of the project deadlines and other related issues with impeccable planning, alternative analysis and proper communication of the real-time progress to project participants and other key decision makers. Maya: Dev, I can't get any of my work done with swami in my team. Maya: He is not a good team player. Because he keeps disagreeing with everything that I believe and say. He disagrees that I am hard working, smart, and committed. Dev: But what has that got to do with your office work? Maya: So either make him agree to my points or get him out of the team. To eliminate any issues or negativity in a team it is best to create a positive work environment. Being a project manager, you can incorporate team building activities to foster a feeling of harmony and teamwork among them. Dev: And with this slide, we come to the end of the presentation. So team, what's your take on this? Dev: Swami... are you with us? Swami: Not exactly. I was practicing mindfulness. Dev: What!! Mindfulness?! Say that again! Swami: Yes, you heard me right. I was meditating. Swami: It helps me to reduce anxiety and stress and maintaining a non-judgmental state of my thoughts and emotions in spite of difficult or annoying situations around me. For meetings to be productive, set and follow a clearly defined meeting agenda, set strict time limits, carve out enough time for Q&A, and ensure that everyone is contributing and sharing their views. Getting team members engaged and participating in meetings helps a lot in achieving meeting objectives. Client: Call for action thingy and stuff like that should be prominent. Basically, we should reduce user's cognitive effort while navigating. Dev (Thinking): How about reducing my cognitive effort to understand these vague requirements?! Requirement issues should be addressed very early in the project life cycle because design problems based on poor requirements lead to design issues that are more difficult and expensive to resolve after project development is well underway. Dev: Boss, Looking at the project plan and milestones, there's no way we're going to meet the deadline at the current pace of work..
Dev: How I wish it was that easy but who will explain to him that nine women cannot make a baby in a month? Crashing is a schedule compression technique to shorten project schedule by adding resources to the critical path without necessarily getting highest level of efficiency. The decision to crash should only take place after project manager has carefully analyzed all of the possible alternatives. Swami: What on earth is that?? Teammate: That's called a classic case of "Programmer’s Burnout". Teammate: By the way, If you didn't realize that is our very own Maya. She has been working long hours for endless months and at times even on weekends. Hiring, developing and retaining the people needed to turn corporate strategy into reality is of critical importance. Hence, a resources allocation plan is an important tool in effective management of scares resources and also avoid employee burn out. Maya: Hey Swami, are you not joining us for the project status meeting? Swami: Maya, just give me a minute white I take a last swing of my coffee I will be there with you all shortly. Maya: By the way, what’s that interesting head gear you are wearing? Swami: That's for brain stimulation. I bought it online recently. Apparently, it helps to stay focused and active during meeting no matter how boring or unproductive they get. Project Communication Management Effective project status meetings not only benefit the project manager but also benefit the entire team, by providing a venue for recognizing milestone achievements, sharing information, and bringing problems/issues to the team. Unfortunately, too often these important meetings are ineffective and fail to benefit the project in the manner intended. Boss: Team, I want to see you all in the meeting room in next five minutes. Something important to share with you. Team Member: I wonder what he wants to share. Boss: Team, the reason for calling you urgently is to share the results of the division's performance. Sorry to share that our performance has been deteriorating and is cause for great concern. Boss: It is time we pull up our socks and hit the ground running. Boss: Team, I recommend that the team now starts behaving as if they own the division and gave their all. We need to bring in a sense of ownership in all that we do to improve productivity. Team Member: Wow, ownership has its own privileges! Hope that means I can come to office and leave office when I want to, travel business class and have fancy perks. When project team members feel a sense of ownership towards their responsibilities, the project team does not just perform productively and are engaged, but they stay longer with the company, love their regular job and duties and sometimes take efforts to broaden their skill-sets, expertise and experience. Hey Swami! What's with this Super hero outfit? Is there any costume party in office I am not aware of? No party. At the appraisal meeting yesterday, Boss suggested that I should always dress for the job I want and not the job I have! Get it! I totally got it but looks like Swami has completely missed the point! One can never take for granted that the receiver will interpret the message the same way as the sender intended it. For effective communication, one needs to consider all factors like different realities, verbal as well as non-verbal messages, and the intended meaning versus perceived meaning. Dev: I just heard that we are agreeing to do the new project, "Less is more", and that too within an unreasonably short time period. It's a challenging project, Boss! Boss: Dev, remember the popular saying “Tough times don't last, tough people do." Here's your chance to showcase your resilience. Dev: But Boss, considering the assumptions and constraints in the project scope even if the team works around the clock, project will not get completed. Boss: Just assume there are no constraints and work against the clock. Hope you get the drift. When we are estimating activity duration, it is important to consider the assumptions and constraints from the project scope statement along with availability of specific resources, types of resources, and resources with specific attributes. Boss: Dev, I just came to know that your project is over budget and is running two months behind schedule. Please explain! Dev: Boss, the holy book says, "Good things come to those who wait." I am making sure you get the best not just a good project in hand and that’s why the delay. Boss (Thinking): Looks like he has not heard the next version of this saying, "but only the things left by those who hustle." I wish he could have shared the project status earlier. Planning the project communications is important to the ultimate success of any project. Inadequate communications planning may lead to problems such as delay in message delivery, or insufficient communication to the stakeholders which can lead to escalation of unresolved issues. Boss: Team, meet Sam, your new project manager. He will be leading the team till Dev comes back from his long sabbatical. Boss: Yes, Swami! Did you just say something? Swami: Err...ahem... well I was just telling him that we are glad to have him as our manager. We were anyway missing that 'someone' to give us an extra push! 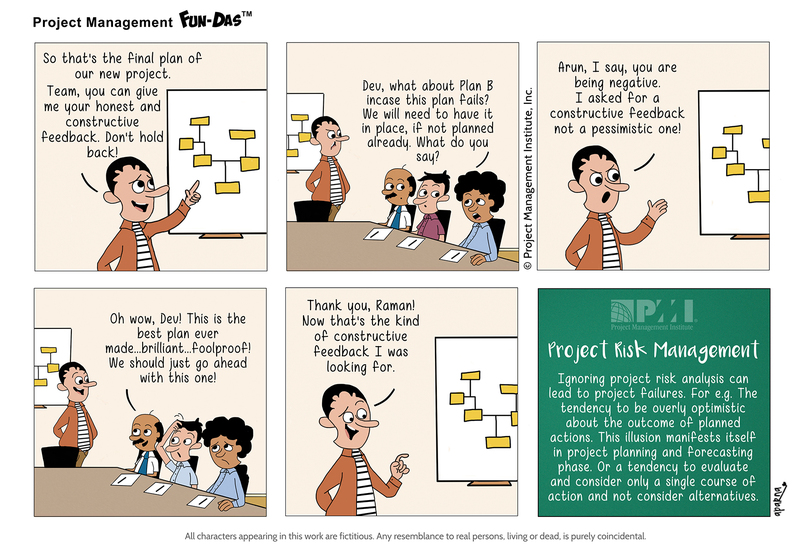 Contrary to common misconception a project manager is not a paper-pusher. He is someone who needs to have technical knowledge & skills related to specific domain of project, leadership skills to guide, and direct a team and strategic and business management skills to better deliver business outcomes. Boss: Dev, can you explain why your project is behind schedule? Dev: Do long hours ata work, zero social life, working on weekends and sleep deprivation cout as valid excuses? Dev: There is zilch morale and motivation. I either need more resources on the project or a long sabbatical. Is there any way you can help? Boss: Of course Dev! You can always count on me. Dev: Honey, I will be home late as usual. My boss has suggested me to watch a dozen motivational videos and listen to prodcasts which according to him will recharge me. But....so far no effect! 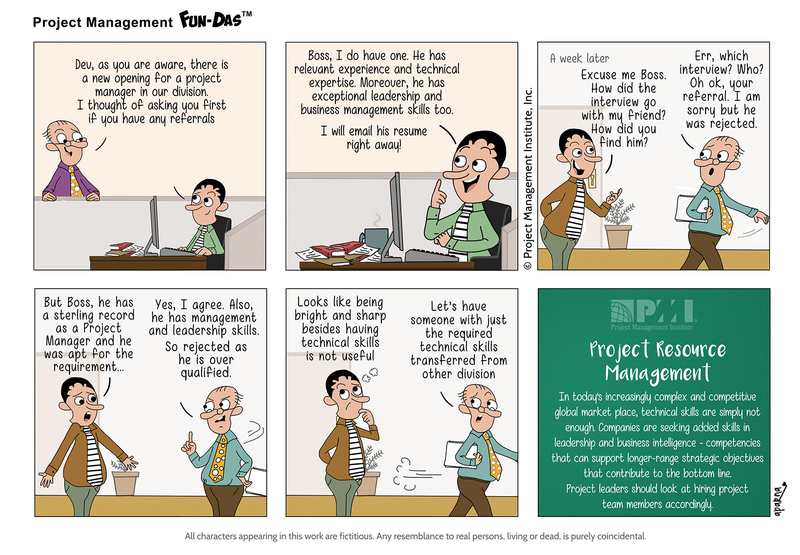 A large part of the project manager's role involves dealing with people. He should study people's behaviors and motivations an strive to be a good leader because leadership is critical to success of projects in organazations. Dev: Excuse me Boss, do you have few minutes to share? Boss: Of course, yes! Dev, you know by now I have an open door policy. Come on in! Boss: I hate changes in plans but let me just show that I am hearing him out. Boss: That's a brilliant suggestion, Dev! But as you are aware our resources are already locked in and we don't want to take any unknown risks by changing gears at this stage. Dev (Thinking): I wonder why does he even have an open door policy. May be to toss ideas and suggestions out of the door. It is important for project manager to have high level of listening, influencing, and team-building skills with emphasis on improving team performance. This is because project team members are motivated by an opportunity to grow, accomplish, and apply their professional skills to meet new challenges. Boss: Dev, could you give me a quick update on the kick-off meeting that took place yesterday for the new project. Dev: Boss, the project is under-resourced and has tight deadlines too. Boss: Oh that's OK. That is always the case. Dev: Oh yeah. And one more thing. We have decided to use agile methodologies to execute this project. Boss: What!!! Now that does not sound good at all. We are not going agile at any cost. Boss: Dev, if you remember, we used agile methodologies last time and the project failed miserably. It was a big mistake. Once bitten, twice shy! Dev (thinking): Reminds me of the old adage, "A bad workman blames his tools". Choosing the right project management methodology for your project is the first step to success. Some of the key considerations while choosing the right methodology are organizational strategic goals and core values, key business drivers, constraints, stakeholders, risks, complexity and project size and cost. Dev: Boss, I have been assigned multiple projects which is affecting my productivity. I seriously need a staycaution soon before I burn out. Boss: That's difficult at this point of time. Instead I have a fantastic alternative. Boss: Dev, Dev... hold on to your horses, will you? I will share it with you tomorrow morning. It's going to be a surprise. Boss: Todah! Presenting your new cubicle. Dev, studies have shown that people become more productive in rooms with blue color. So here it is! What do you think? Dev (thinking): Now what do I say. This news is like a bolt from the blue. I have no clue about productivity but I am definitely feeling blue already. 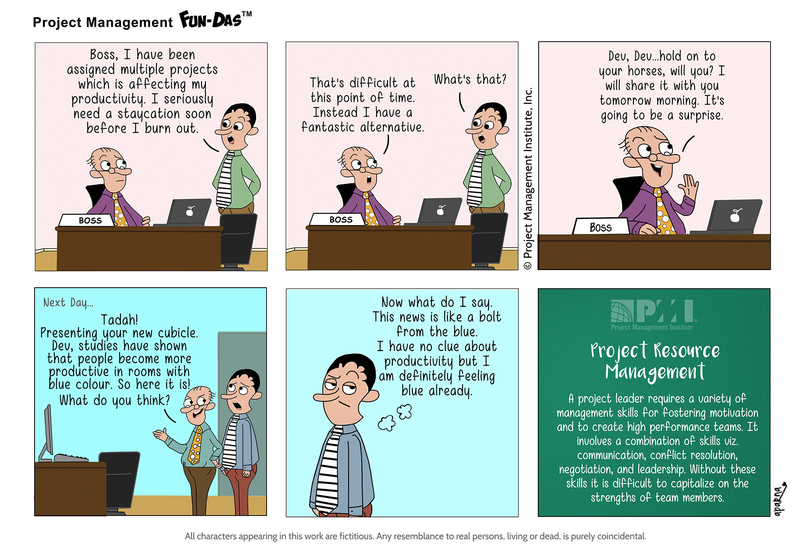 A project leader requires a variety of management skills for festering motivation and to create high performance teams. It involves a combination, conflict resolution, negotiation, and leadership. Without these skills it is difficult to capitalize on the strengths of team members. Mr. Narayan: Dev, are you ready to present the status of our project? Dev: Yes Mr. Narayan. Right away! Mr. Narayan: Dev, where are the details on the control measures for risk management? I did not see it so far. Dev: Err... hmm... Well, that has been addressed in the upcoming slides. Dev: And with this slide, I conclude my presentation... Mr. Narayan, you look skeptical somehow. Dev (thinking): Hope he does not realise that the risk management part has not been covered at all. Dev: Mr. Narayan, don't stress. We will cross the bridge when we come to it. 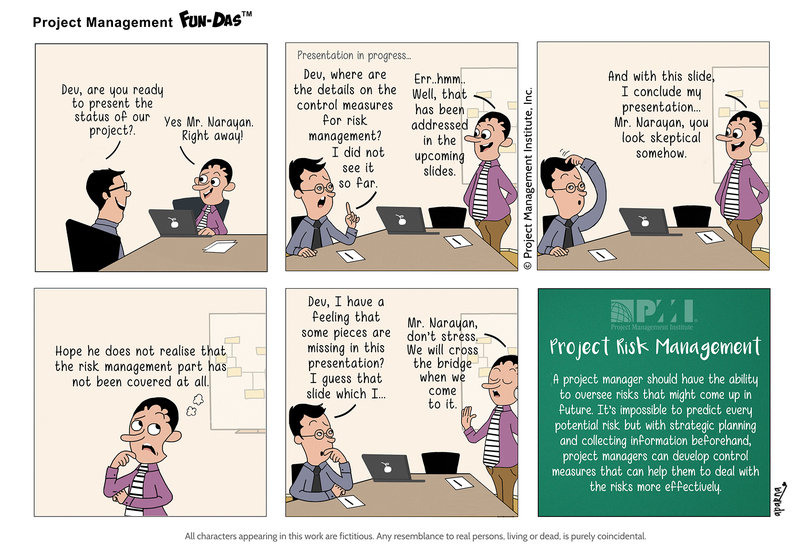 A project manager should have the ability to oversee risks that might come up in future. It's impossible to predict every potential risk but with strategic planning and collecting information beforehand, project managers can develop control measures that can help them to deal with the risks more effectively. Dev: Excuse me Boss! I need to talk to you urgently. Boss (thinking): Danger! High Alert! Be on guard Swami. Dev: I had shared earlier as well and wanted to gently remind you about the project management software we need to buy urgently. Boss (thinking): Uh oh, not again! Dev: That software tool is critical for us. Our project may get delayed by a substantial margin without it. Boss: Dev, we have spoken on this before. I have budget just enough to sustain you and your team on this project. Either you let go of some of your team resources or stop pestering me for these frivolous, expensive tools. Dev (thinking): These don't even seem like options that can be considered. Sounded more like a threat than a solution. A resource allocation plan is crucial tool in effective management of scarce resources. The timing of the need of those resources can be and should be determined within the project schedules. A resource plan, which describes the type of resource needed and the timing of that need, is critical to effective resource management. Dev: Boss, we are soon going to be initiating 'Flexi-Pro', our new project. Dev: This project requires a team with Agile skills and experience. Since we don't have in-house resources, we will need to hire new staff. Boss (thinking): hmmm... Agile skills and experience?! Boss: Dev, meet your 'Agile' team for the new project - Flexi Pro. Now get started with it. All the best! Dev: Oh god! He and his twisted logic! How do I explain to him? 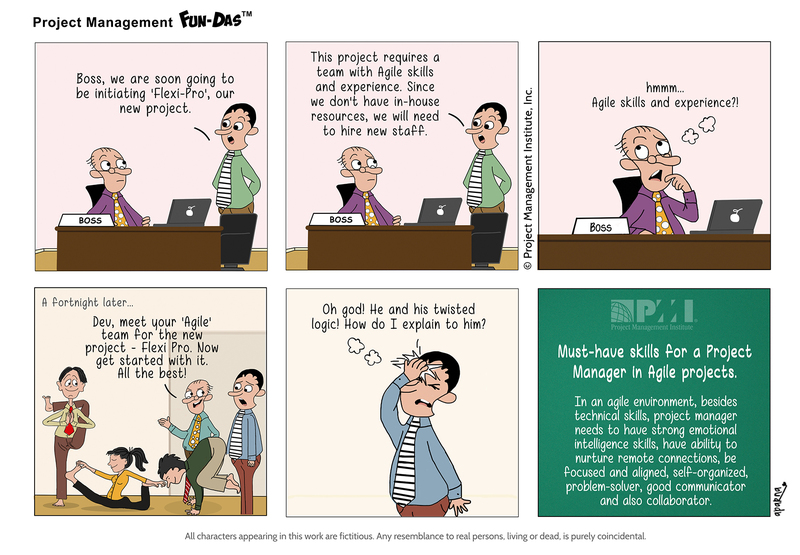 Must-have skills for a Project Manager in Agile projects. In an agile environment, besides technical skills, project manager needs to have strong emotional intelligence skills, have ability to nurture remote connections, be focussed and aligned, self-organized, problem-solver, good communicator and also collaborator. Dev: Boss, I am sorry to say this but there are just too many projects I have been asked to lead and they are all pulling me in different directions. Dev: If I can be relieved from some of them I will be able to focus on them in a better way. Boss (thinking): What do I do? He is the best project manager available in the division right now. Boss: Well, Dev! I have read somewhere that one needs to have some form of stress to keep oneself motivated and creative. Boss: The organization cares for you and hence you have been given so many opportunities to help you grow as a leader and stay motivated. Boss: So why don't you just get back to work before your motivation starts dipping. Management must weigh numerous factors, such as urgency of the project, required skills, competence and availability of staff, the impact of resource levels on delivery schedules, the maturity of organization's processes and of the PMO while determining the appropriate allocation of resources on projects. Boss: Dev, I want you to take over "Project Titanic" asap! Ram has quit without any notice. Dev: But Boss, the project take over is draining our resources and moreover it may not realize the intended benefits as planned. Boss: Don't worry. We need to have the project completed anyway. Dev: But Boss, if it's not showing any great prospects why invest in it? Let's just scrap it! It's anyway a 'Sinking Ship'. Boss: This is pretty much a prestigious project for the company. So without much delay I would suggest you start focusing on how to complete it. Boss: Just take charge of this ship and help it sail smoothly. I will clear the coast for you. Dev (thinking): I am already having a weird sinking feeling about this project. Good Lord, help me stay afloat! Project Managers have a role in ensuring that an organization's expected benefits are delivered once a project is complete, Organizations are leaving their strategy to chance when they do not focus on BRM as a central part of project and program management. Boss: Dev, I hope we are delivering the project on time. Dev: I am afraid, no! Boss: What do you mean? Dev: The client has requested for last minute changes. So we may miss the delivery date. Boss: Dev, you have to find ways to release it on time. Dev: Boss, I have only two ways. Dev: Either I stick to this impossible deadline, give a shoddy product and make client unhappy or push the deadline forward, give a quality product and make client happy. Boss: I have a third way. You push the envelope, release a good quality product on time and make the client and me happy. Or be ready to be pushed out! What say? Follow the pre-established policy or plan for making changes in scope. Also, plan your approval and documentation process in advance. Transparency and open communication builds confidence and trust amongst all respective stakeholders. Dev: So that's the final plan of our new project. Team, you can give me your honest and constructive Feedback. Don't hold back! Arun: Dev, what about Plan B incase this plan fails? We will need to have it in place, if not planned already. What do you say? Dev: Arun, I say, you are being negative. I asked For a constructive -Feedback not a pessimistic one! Raman: Oh wow, Dev! This is the best plan ever made...brilliant...foolproof! We should just go ahead with this one! Dev: Thank you, Raman! Now that's the kind of constructive feedback I was looking for. Ignoring project risk analysis can lead to project failures. For e.g. The tendency to be overly optimistic about the outcome of planned actions. This illusion manifests itself in project planning and forecasting phase. Or a tendency to evaluate and consider only a single course of action and not consider alternatives. Boss: Dev, meet Nitya. She is few months old in the company. I have transferred her from the operations team to work on your project. Dev: Boss, no offence but, I need someone with more experience and relevant qualifications. Dev: Moreover, have we checked if she is inclined for this job profile? Boss: Dev, don't overthink. With the right training everything will fall in place. And Nitya will provide the team, the much needed support. Boss: Dev, you look hassled. Hope your project is on track. Dev: Boss, after a month long intense training, Nitya has vanished into thin air. Now I am stuck between the project deliverables, finding a replacement and answering the client. Dev: By the way, she left a note for us which says, "Change is the only constant in life." While acquiring project team, it is important to use a multi-criteria decision analysis tool to verify whether the team member has relevant experience, competencies, knowledge, skills and abilities as required For the project. Team Mate 1: Good Lord! Can just do away these Monday status meetings with our Boss? Team Mate 2: They are more like "mundane" status meetings! Absolutely Non-Productive! Yawwwnnn!! No-agenda! Psst... How do we convey to him? Boss: I have been looking all over the place for you guys. What are you doing here all huddled up, it is time for our Monday meeting. Team Mate 1: Err... yes Boss! We were just prepping ourselves with a shot of caffeine for our long meeting ahead. Team Mate 1: It helps us to stay alert and focused. Also, stops our mind from wandering to important issues that need attention. 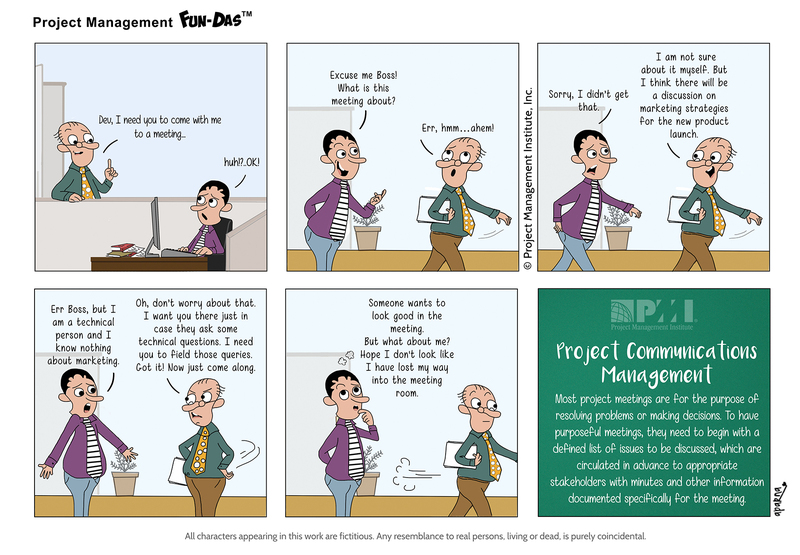 Project status meetings are crucial tool in project manager's tool box. Status meetings should be concise, boost team morale, provide timely information on project status, uncover potential risks, and encourage relevant information sharing between team members. Client meeting in progress... Dev: Mr. Narayan, before I get down to the brass tacks, I would like to note down all the goals and requirements For the new website. Mr. Narayan: Well, Dev I would like our company website to look modernish with more white space. Lightish so the speed is not an issue. criendlish with easy navigation and interactive content... In meeting room: Programming language should be..., Easy to use CMS... , Mobile responsive, API. CSS..., Frameworks... Blah! Blah! Next Day.. Boss: How did the briefing go? Got all requirements? I believe he is quite demanding. Dev: Yes, he is demanding and at the same time confused. And the brief was full of complex and contradicting info... Dev: ...making it appear as though it is a merge between two separate briefs.. But don't worry, I just shut him up with my KISS. I mean the "Keep It Simple, Stupid!" approach . Project Scope Management One of the major reasons for project failures is due to poor requirements gathering. Project managers should address requirement issues very early in the project life cycle because problems based on poor requirements lead to issues that are more difficult and expensive to resolve after projec is underway. Maya: Boss, I intend to take up this advanced project management certification. So I was keen to know if I could get corporate sponsorship For the same. Boss: Maya, let me remind you that you are not a Fresher in this profession. You have 20 years of work experience. So why do you need a certification? Maya: But Boss, I need to advance my project management skills and learn new technologies. This will open up better opportunities within the company and I will get to handle complex projects, effectively and efficiently. Boss: Oh, in that case why don't you try putting in more hours of work, work over weekends or may be forego your vacation time. You will get noticed and promoted one day for sure. Dev: How did it go? Did you manage to hit the bull's eye? Maya: Nope, this bull is quite headstrong. Instead, I ended up hitting the glass ceiling. PMI's Pulse of the Profession® Relevance of certifications. 72% of PMO leaders feel certification is very relevant for mid-career project managers. Certifications typically require ongoing professional development, allowing project managers to evolve enhance, and grow a variety of skills, including technical, leadership, and digital skills. Dev: Boss, the Phase I of Project Nebulous is not complete and we cannot start Phase II which is dependent on it. Hence, I see the project getting delayed. Boss (thinking): Project is critical but we don't have extra time or resources. I need to think of some way out. Think Think Think! Boss: Why don't we implement the project using Agile approaches. Faster and Flexible with same resources. Dev: But Boss, Agile is not about "Doing more with less". 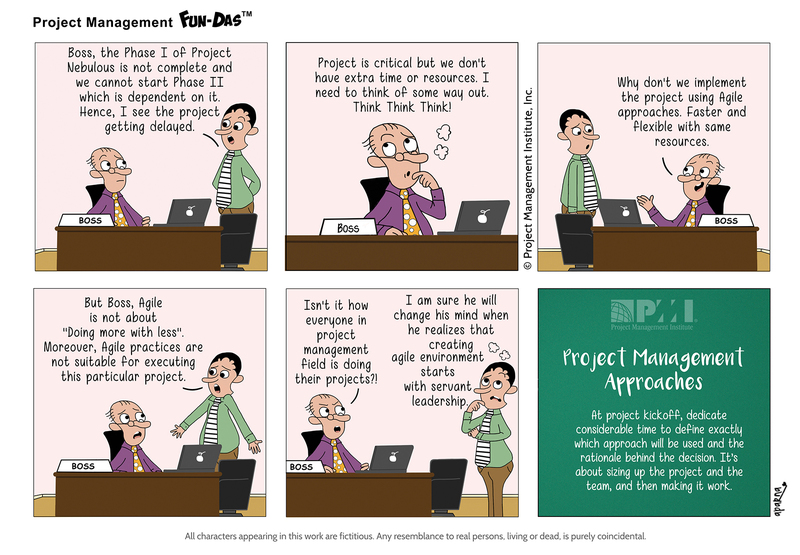 Moreover, Agile practices are not suitable For executing this particular project. 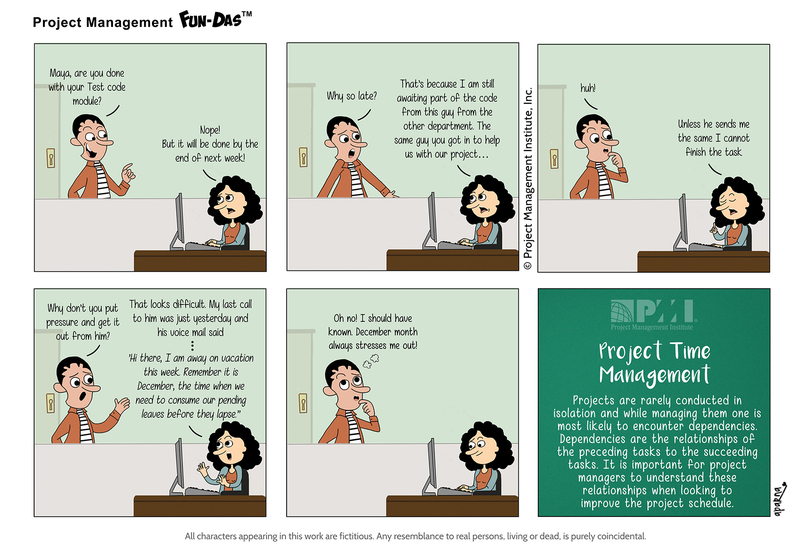 Boss: Isn't it how everyone in project management Field is doing their projects?! Dev (thinking): I am sure he will change his mind when he realizes that creating agile environment starts with servant leadership. At project kickoff, dedicate considerable time to define exactly which approach will be used and the rationale behind the decision. It's about sizing up the project and the team, and then making it work. Dev: Boss, I do have one. He has relevant experience and technical expertise. Moreover, he has exceptional leadership and business management skills too. I will email his resume right away! Dev: Excuse me Boss. How did the interview go with my Friend? How did you find him? Boss: Err, which interview? Who? Oh ok, your referral. I am sorry but he was rejected. Boss: Yes, I agree. Also, he has management and leadership skills. So rejected as he is over qualified. In today's increasingly complex and competitive global market place, technical skills are simply not enough. Companies are seeking added skills in leadership and business intelligence - competencies that can support longer-range strategic objectives that contribute to the bottom line. 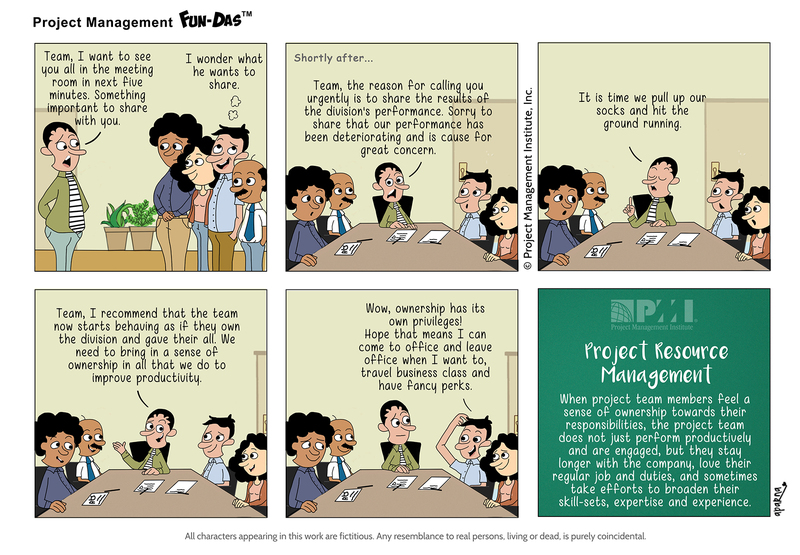 Project leaders should look at hiring project team members accordingly. Dev: Boss, you just gave me another project while I already have my hands full. Boss: Have you ever heard of multi-tasking, Try that! Dev: But I believe that it lowers work quality and efficiency. Boss: Those are all myths. Watch me! I will take this call while you continue talking. Dev: Well, multi-tasking has been found to increase production of cortisol, the stress hormone. And research suggests that those who multi-task more had less empathy and emotional control. Boss: I am done with the call. Sorry, did not quite catch the last part. What was that? Dev (thinking): Sometimes I am glad he multi-tasks. Elimination of resource multitasking reduces conflicts between priorities and keeping team member focused on those items that are critical for project success. All of these benefits support reducing project risk and reaching the end goal of finishing the project on time, within budget and without scope reduction. Dev (thinking): Gasp! Pere comes the "but". Boss: ....make sure it is complete within two months. We have to showcase this at the upcoming conference. Dev (thinking): I knew this was coming! Boss: Oh, don't worry about planning and documentation. As you are aware we will be following Agile approaches in this project. Boss: Now isn't that a silver lining for you and the team! Dev (thinking): Silver lining? How ignorant. I wish I had a Silver Bullet instead. Though there is extensive Flexibility in Agile projects, planning is required continuously and inherently. Secondly, whether Agile or Waterfall, documentation is crucial as it provides the team to physicalize valuable knowledge gained during the project. Boss: Dev, I want you to do the demo of our new application to our US based clients next week. Remember to choose a mutually convenient time as they are quite busy and difficult to get through. Boos: By the way, I am on a business tour so you will have to drive the demo. Make sure it goes well. Boss: Just back in office from my tour. So how did the demo go? What was the client feedback? Dev: …when the client turned up an hour later we realized that it was the same day the Daylight Savings Time change was introduced. Boss: Dev, you just frightened the living daylights out of me with this news. It was an important meeting. How could you forget? 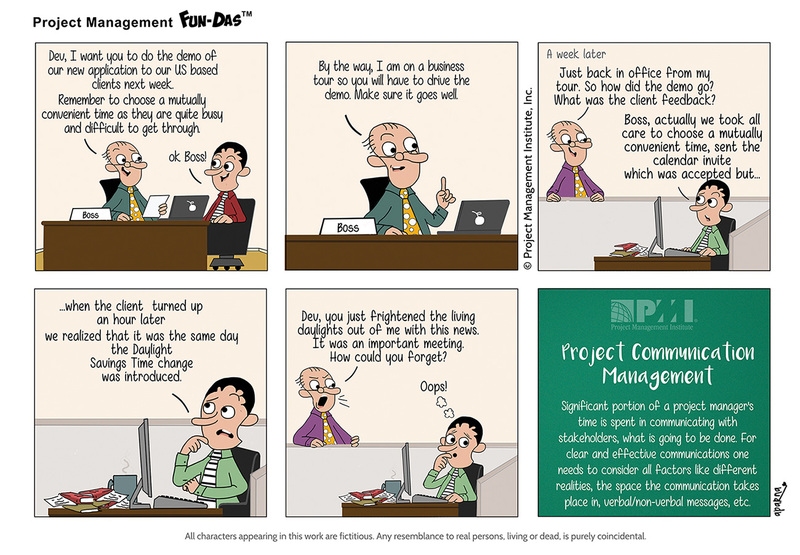 Significant portion of a project manager’s time is spent in communicating with stakeholders, what is going to be done. For clear and effective communications one needs to consider all factors like different realities, the space the communication takes place in, verbal/non-verbal messages, etc. Team Mate 1: Guys, I am so looking forward to the long weekend. I am going out for a hike with my friends. What about you all? Team Mate 2: Yes, me too! Boss: Team, I am quiet keen to know what this excitement is all about but before that one important update. We have an important pitch coming up and I want you to share critical data that I need over the weekend for the same. Boss: Remember, this pitch is for a prestigious client so the team will need to gather some motivation and enthusiasm to work over the long weekend. Team Mate 1: My enthusiasm and motivation just “went for a hike” after hearing this…what about that! 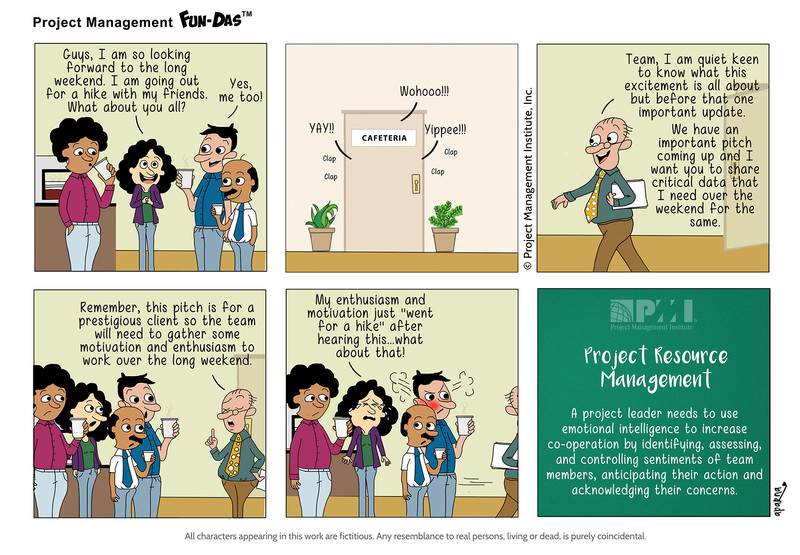 A project leader needs to use emotional intelligence to increase co-operation by identifying, assessing, and controlling sentiments of team members, anticipating their action and acknowledging their concerns. Boss: Ravi, I have some bad news for you. The management has decided to downsize you and your team. Ravi: Boss, this is so unfair. The team has always performed beyond expectations and you know that well. Then why? Boss: Ravi, this has nothing to do with performances. The organization has decided to adopt agile approaches and practices for managing projects henceforth. Boss: So we won’t need project managers like you any more. Boss: I hope you understand me. Ravi (thinking): Of course I do understand you and your ignorance about the fact that there is no “one-size-fits all” approach to managing projects. To lead your project to success, there are many methods — agile, waterfall, hybrid, and many more — and often no single approach will do. It’s important to find the right method to match the needs and requirements of your project. Boss: Did you finish the project tasks we discussed in our last meeting? Dev: Hmm, well kind of? Boss: What do you mean “hmm, kind of.” Dev, clearly we need to work on your sense of urgency. Boss: And what? The balance 20% is waiting for Christmas, is it?! Dev: That 20% is what I could not understand as you rambled off since you were rushing for a meeting. Dev (thinking): Yeah, of course! Your door is always open but sadly, can’t say the same about your mind. Project leadership calls for clear communication about goals, responsibility, performance, expectations and feedback. Regular reporting of the project’s progress and feedback is crucial to the success of the project. Communicating in a clear and precise manner is paramount, so that all understand what the key messages are. Dev: I heard you have put me onto yet another project. I am already neck deep in others and with one more, I will not be able to put my head above water. Boss: Dev, stop over playing. I am sure you will get on with the project like a duck to water. Dev (thinking): I wish the projects also rolled off easily like water off a duck’s back. Many organizations have several projects going on at once. This requires thorough project resource planning because usually team members are active on several different projects, all at the same time. 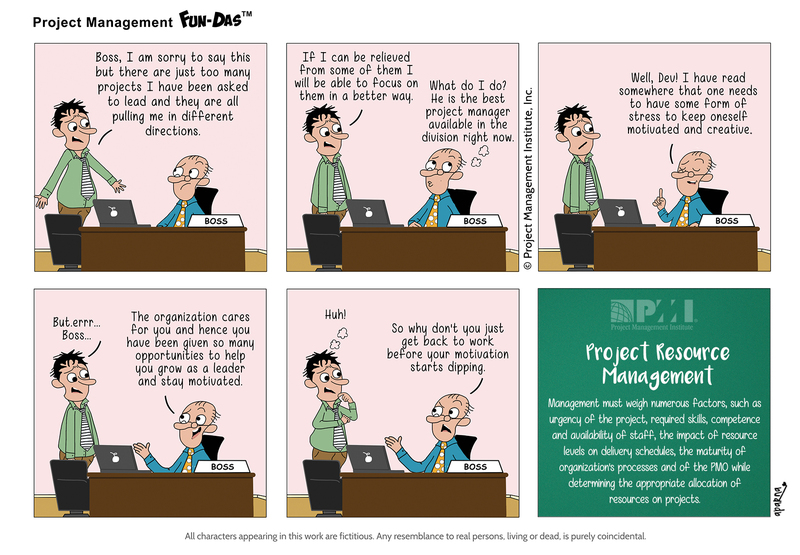 Also, scheduling becomes complex when the same resources are shared across divisions, with different project managers. It can also lead to your best resources becoming burned out. Boss: I am putting you on Maya’s project as she will be going on medical leave a week from now. Boss: Make sure the necessary handover is completed. Dev: But Boss, I am a Data Analyst and Maya’s project scope is beyond my understanding. So how will I ..
Boss: Dev, when will you learn to step up and be enterprising? Moreover, this project is not at all complex. You can take it up as a small challenge. Boss: How is the project “Square Peg in a Round Hole” coming along? Dev (whispers): Just like it should be…in a hole! Dev (thinking): Never mind, he will never get it! 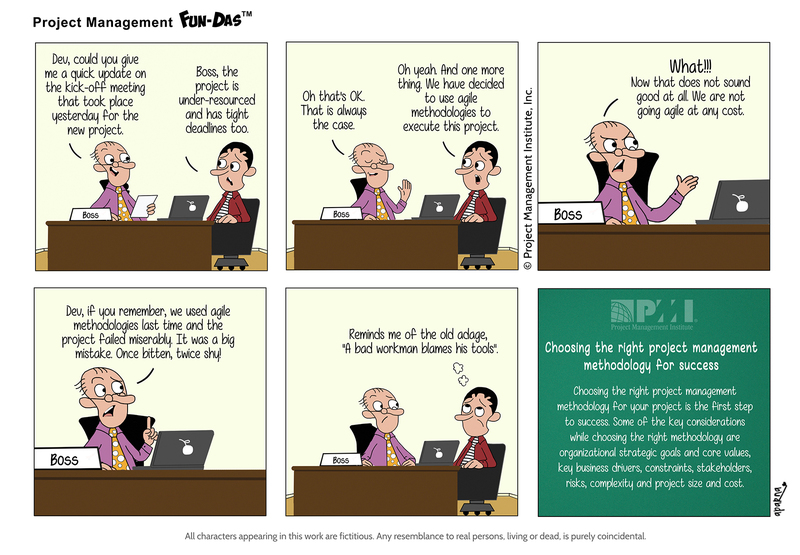 Selecting the ‘right’ people to manage projects is the key to minimizing project failures, maximizing organizational efficiency, improving time to market, and increasing profits. With the right project managers in place, projects are managed more effectively, increasing the probability for success and return on the project management investment. Boss: Your project milestone has been missed by almost three weeks. Do you want to explain? 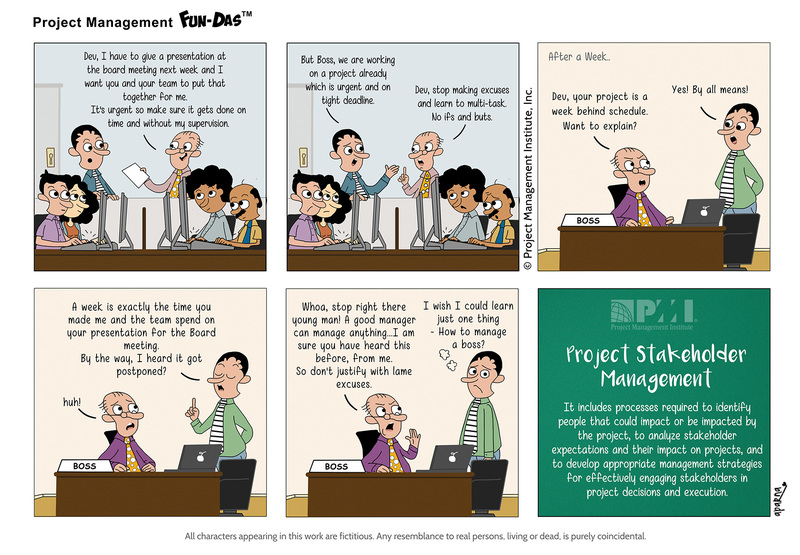 Project Manager: So it is like this…In the last quarter I have been drawn into several project status meetings where nothing concrete was discussed and not much was achieved. Project Manager: Yes, I did an analysis of where most of my productive time was wasted. And I have realized that it was only attending meetings where there was no pre-set agenda, there was ineffective handling of action items, spending time on tangents and ill-prepared team members. 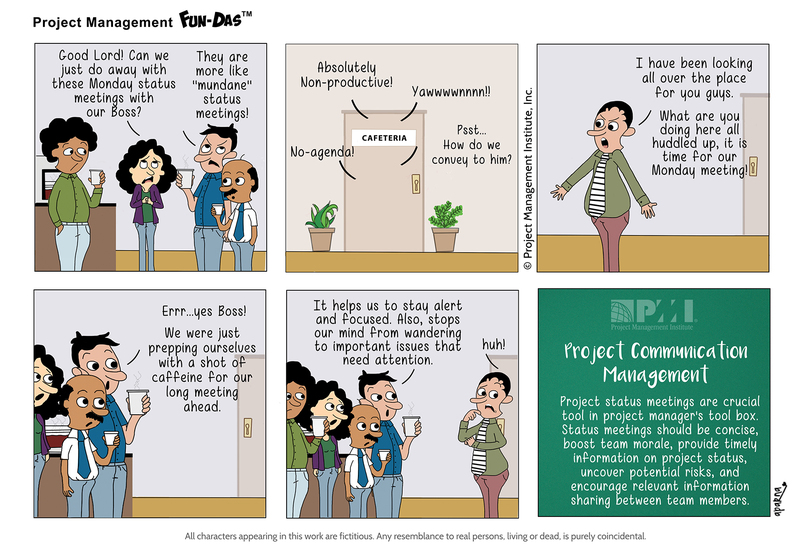 Effective status meetings are those that not only benefit the project manager, by providing timely task updates, but also benefit the entire team, by providing a venue for recognizing milestone achievements, sharing information, and bringing problems/issues to the team. Dev: Boss, as you are aware, the Financial Management application that we are developing needs to be integrated with third party application. Boss: Yes Dev, I know…but why do you look concerned? Dev: Because the team does not have required knowledge and exposure to work on this third party application..
Dev: To avoid any unwarranted delay and also for future maintenance requirements, I propose we train them. Boss: Sorry to say this but we no longer have training budget. Boss: We are doing business in difficult times where every penny counts, moreover, training programs don’t add much value according to me. Dev (thinking): I know what he is thinking right now. But the only thing worse than training your employees and having them leave is not training them and having them stay as said by Henry Ford. Boss (thinking): Train them and then see them leave to join competitors. No way!! Training is an important technique for developing project teams. It helps to improve skills and competencies, and employee motivation, reduces staff turnover rates, and improves overall project performance. Project Manager: Team, we shall be starting with our new project from next week. And for that I have made a perfect project plan which details out all the resources, tasks and dependencies related to this project. Project Manager: Now that each one of you knows what tasks have to be accomplished we shall meet in couple of weeks for a quick update on the same. Project Manager: Did you all finish the tasks that we talked about in the last meeting? Team Mate 3: I have finished only half of my part and for other half I am waiting for Maya’s input. 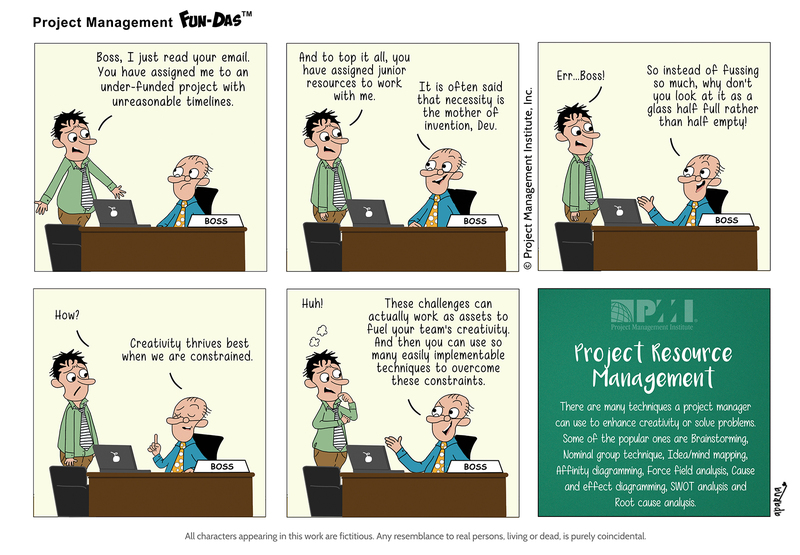 Project Manager: Huh! So where on earth is Maya? She is the key resource for this project. 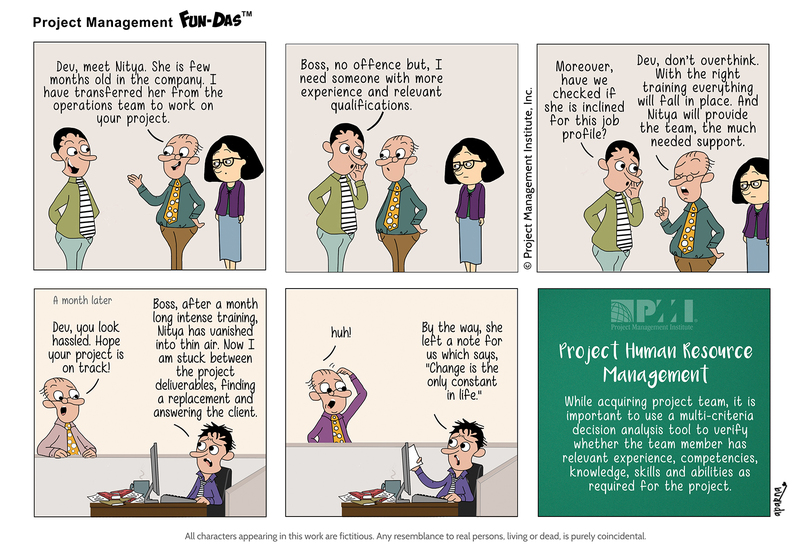 Project Manager (thinking): Oh boy! How did I forget Maya’s early maternity leave sanction in the Human Resource Management Plan. Team Mate 2 (whispering): Looks like this project will go on a “pregnant pause” mode now. As part of the Human Resource Management Plan, the Resource Calendar documents the time periods that each project team member is available to work on the project after taking into consideration their constraints, including time zones, work hours, vacation time, and commitments to other projects. Boss: Guys, I have a very important project to be assigned to one of you. It needs to be initiated ASAP as we are pretty tight on it’s deadline. Boss: But before that I need status updates of projects from both of you. Dev, you go first! Dev: Boss, I have my plate full already. If I take it up then that would leave me with very less time to focus on my ongoing projects. And that would lead to missed deadlines! Are you okay with that? Boss: Ravi, since you don’t have much to say on this, I assume you have enough bandwidth to take this project. Ravi (thinking): If I say ‘No’ I might look unproductive and moreover my appraisals are around the corner. So I better say yes. Boss: Let me assure you that this is a very prestigious project for our organisation and is of topmost priority. 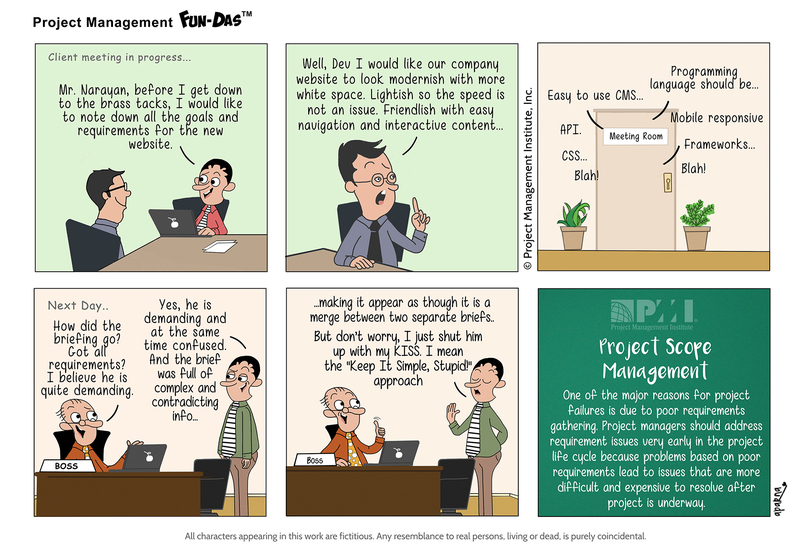 Ravi (thinking): Looks like every project in this organisation is of top priority…don’t know what to focus on! Some organizations have not sufficiently defined their goals and strategies. 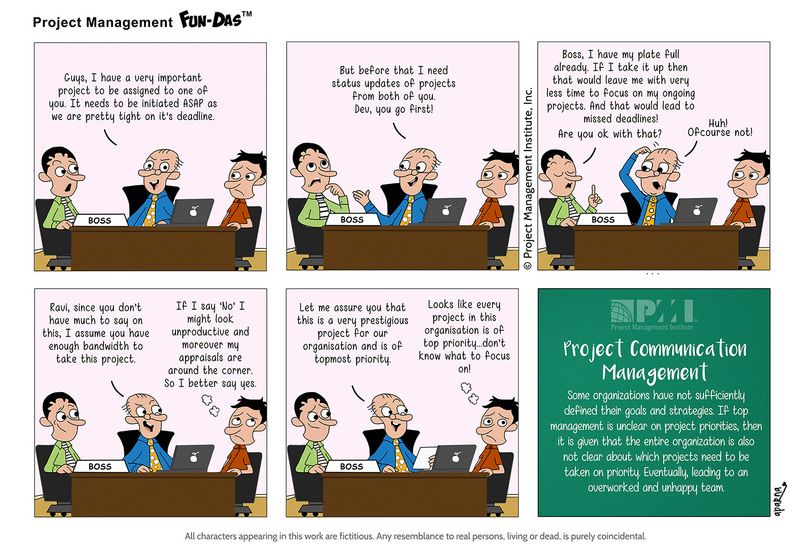 If top management is unclear on project priorities, then it is given that the entire organization is also not clear about which projects need to be taken on priority. Eventually, leading to an overworked and unhappy team. Project Manager: Maya, why haven’t you done those minor changes in the code, yet? Project Manager: They were supposed to be done yesterday itself. Client had a demo scheduled today! I had mentioned so in my mail too! Project Manager: I doubt if you read my mail ever. Maya: Oh! Looks like you are talking about the mail which had a long and rambling conversation thread. Maya: It was such a confusing and overwhelming email..
Maya: It took lot of time for me to understand what needed to be done from my end. And by the time I figured that, it was time for me to leave for the day. Significant portion of a project manager’s time is spent communicating what is going to be done. Hence, for effective and efficient communication, project manager needs to consider all the factors like the different realities, the space the communication takes place in, verbal as well as non-verbal messages, and the intended meaning versus the perceived meaning, etc. Project Manager: Boss, how could you assign Maya on another project? How am I supposed to complete the project on time, now. She was the only key resource on my team. 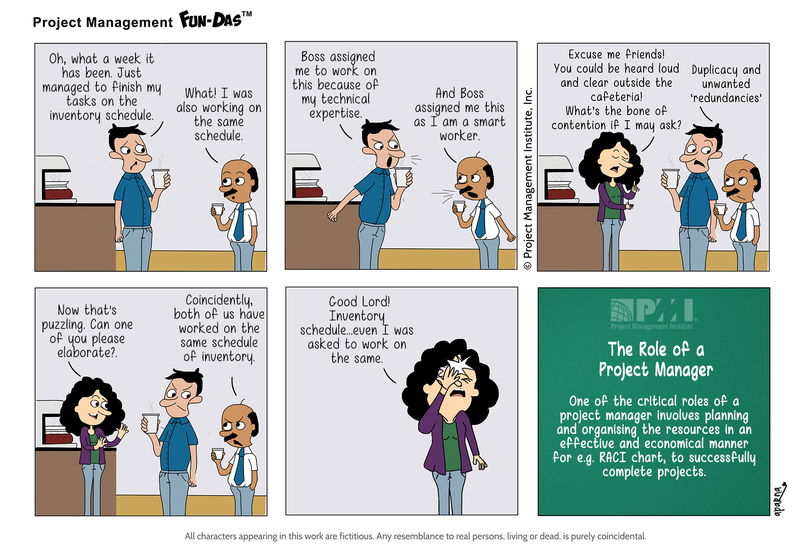 Project Manager: So…so what Boss! Boss: The management thought that the project has fallen through and so we decided to move the resources to the new one. 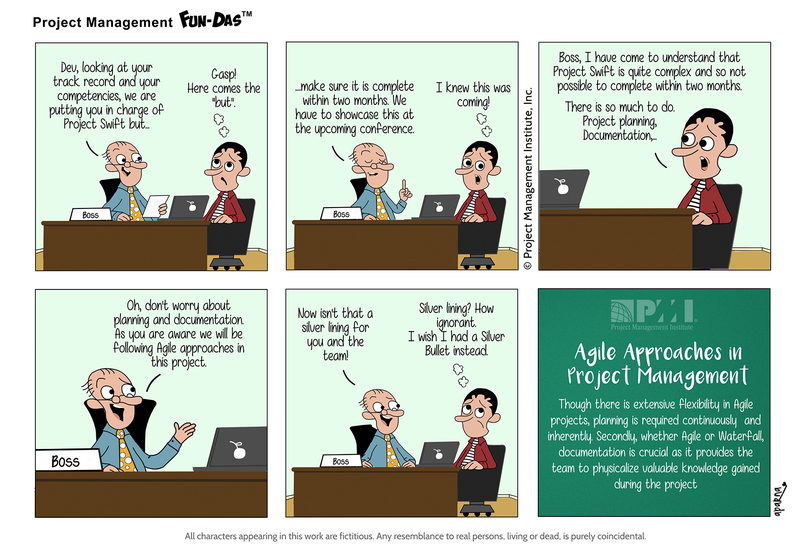 In fast paced environments, many times project managers share team members with other project managers. Sponsors and executives do not have access to updated schedule/reports until it is too late to either redirect the effort or to cancel the project. 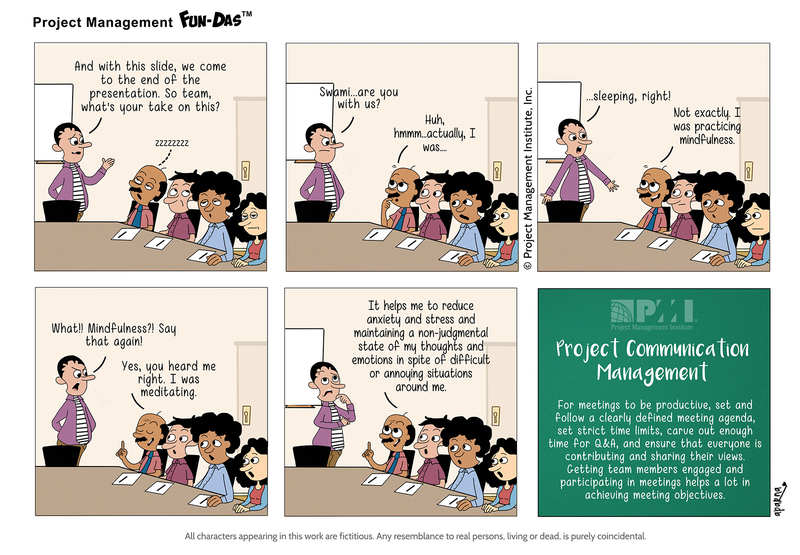 Hence, executives must communicate to all team members the importance of updating tasks/projects on regular basis. Boss: How is “Smooth Sailing” project coming up? 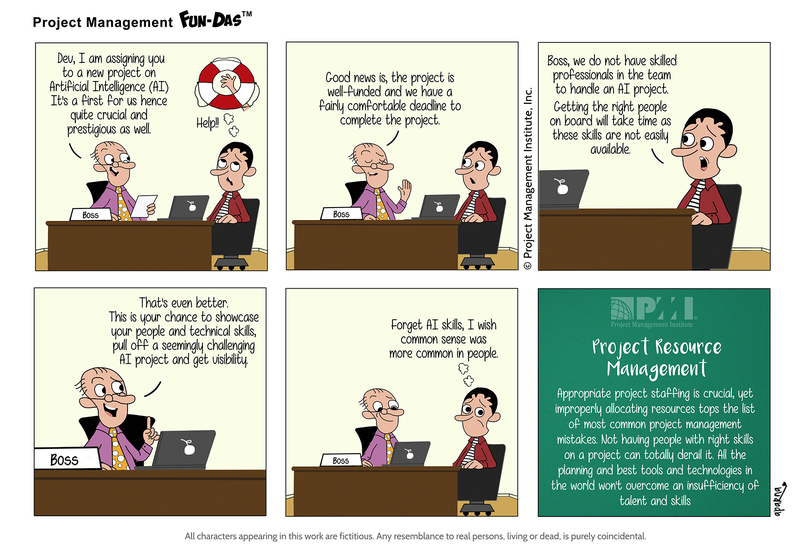 Project Manager: Great! boss. No sweat at all. Boss: I have not heard much on “Smooth Sailing.” No news is good news I hope. Project Manager: Absolutely fine. We are smooth sailing. Boss: We are one month away from the project deadline. Hope all well. Project Manager: Boss, I am glad you asked. We have hit rough weather with “Smooth Sailing.” We have missed certain deadlines on the project…and may even go over budget. Boss: What! Were you sleeping the last two months? Why did you not come earlier to me? Project Manager: No Boss, there has been schedule slippage and ..
Boss: Don’t say a word! All these months I have been telling the client that “Smooth Sailing’ is indeed smooth sailing. And now what do I tell him? That it is in hot waters?! Control Schedule process helps to update project progress and manage changes to the schedule baseline to achieve the plan. The key benefit of this process is that it provides the means to recognize deviation from the plan, take corrective actions and thus minimize risk. Boss: As a cost-effective approach, our USA counterpart has decided to outsource part of a new project work to our India Team. It’s quite an interesting and challenging project. And we got to work collaboratively. 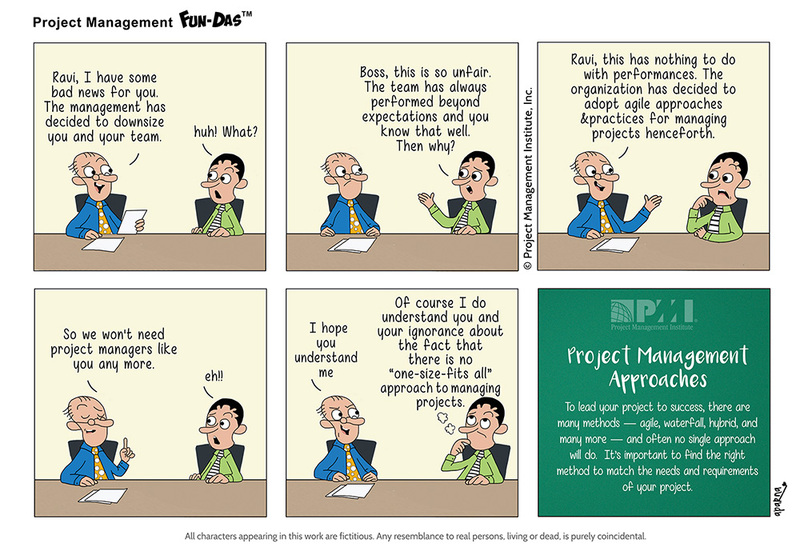 Boss: By the way, schedule a meeting in the coming week for a better understanding of the project. And yes, they are going to handover the project requirements during the meeting, so please be attentive! Project Manager: Boss, as proposed, I did schedule a meeting with our US team but I could hardly understand what they spoke. I think it was their accent. Believe me I was all ears! Boss: What time did you schedule the call, may I ask? Project Manager: Hmm..it was around mid night. Boss: What! Why could you not suggest them to schedule the call at a mutually convenient time? Their accent was not the problem but it was your assent to have a call at such an unearthly hour. In today’s increasingly complex and competitive global market place, technical skills are simply not enough. Project managers and team members are required to have soft skills such as negotiation and influencing skills to make a project successful. Dev: Boss, need your urgent attention. I just realized that the technology to be used for Project Steadfast may not be cut out from our existing platform. Dev: Yes, it could make the application slow and unstable with bugs. Also, may lead to development failure. Boss: Whoa! Stop right there! I know you are the Project Lead but who's the boss here?! No need to teach me the technical details. I have 30 years of experience. I know what's right and what's wrong. Boss: Dev, I have just been told that Project Steadfast is in trouble. You have to do something about it urgently. Dev: I knew this would happen. Didn't I tell you long back about this issue. See, I am so good at anticipating problems but you don't even value it. Boss: I wish you were even half as good at convincing me and forewarning me. We could have surely averted this situation today. Now get this sorted out at earliest. Effective negotiation skills are critical for a project manager to be successful. It is important to embrace a mindset that everything about a project is negotiable and that a project leader needs to be a skilled negotiator. Hence, right up front is the necessity to define project success and establish desired outcomes. Project Manager: Maya, are you done with the Test Code module? Maya: Nope! But it will be done by the end of next week! 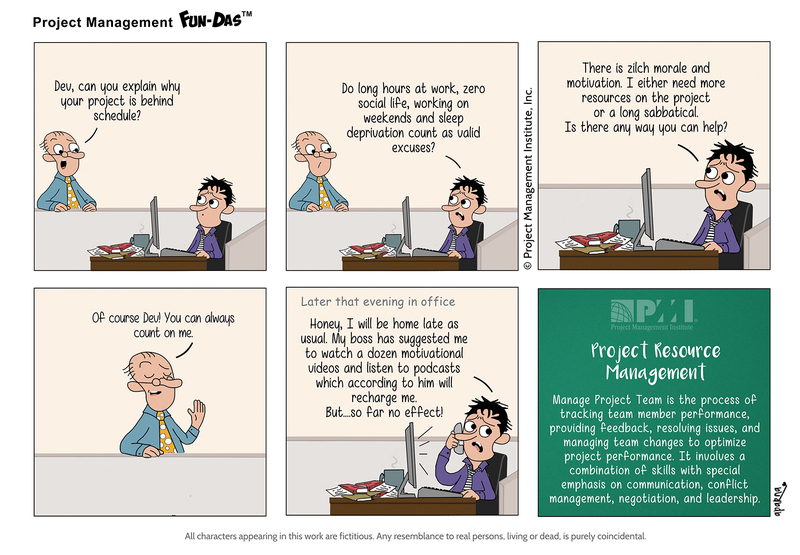 Project Manager: Why so late? Maya: Unless he sends me the same I cannot finish the task. 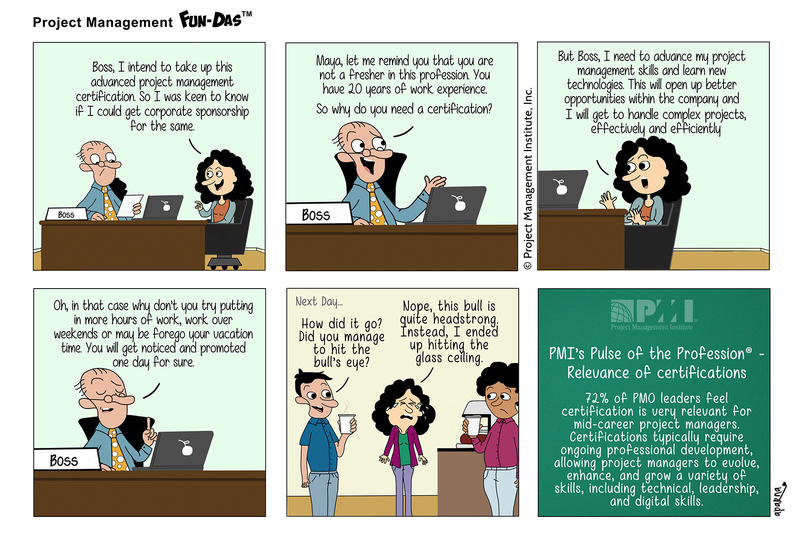 Project Manager: Why don’t you put pressure and get it out from him? 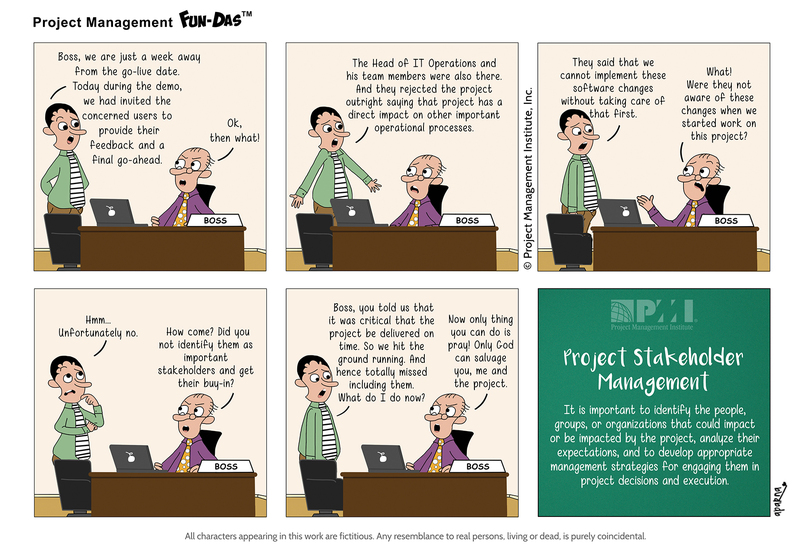 Project Manager (thinking): Oh no! I should have known. December month always stresses me out! Projects are rarely conducted in isolation and while managing them one is mostly likely to encounter dependencies. Dependencies are the relationships of the preceding tasks to the succeeding tasks. 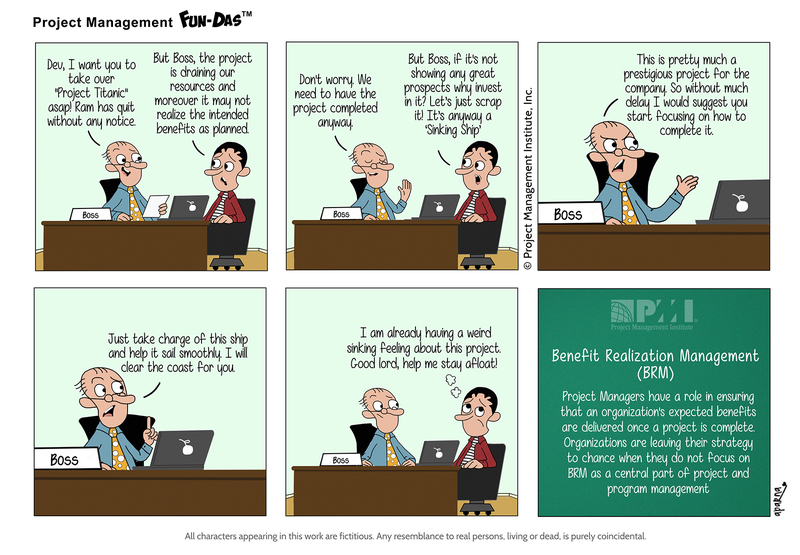 It is important for project managers to understand these relationships when looking to improve the project schedule. Boss: Team, don't look so tensed. Relax! I have not called for this meeting to reprimand you on your dismal performance which caused the last project to fail. Team mate 1: Oh really! It seems like it though. Boss: ...But as a forward looking leader I want to offer something valuable to you. This I am sure will surely motivate the dispirited team. 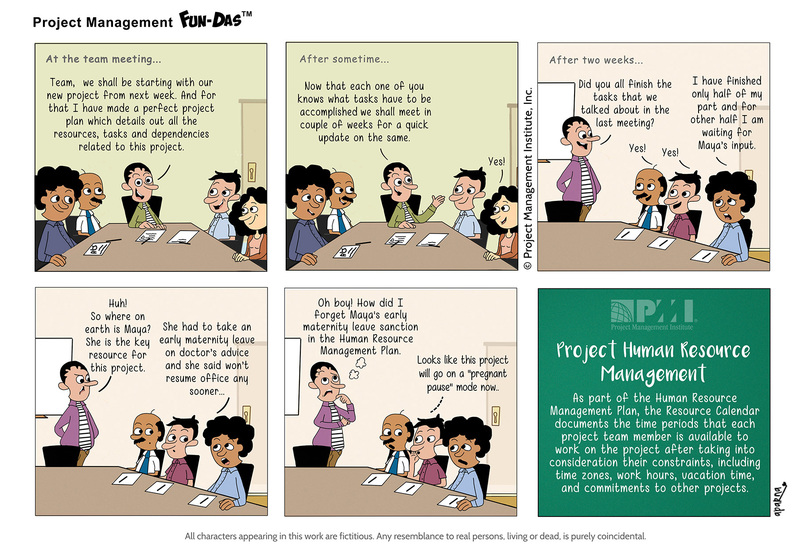 Team mate 2: Is it a compensatory leave for all the weekends we worked in last 3 months? Boss: Nope! You have to sign up for a Performance Improvement Plan which includes attending a tutorial after office hours for the next one month. Boss: And this will be funded through your salary budget. So expect a cut in your next month's salary. Team mate 1: huh!! huh!! Team mate 2 (thinking): Is this motivation or entrapment? Team mate 3 (thinking): What can we expect from him anyway! If a project is to succeed, it must have both a motivated project leader and a motivated project team. To encourage positive "change management", top management should provide an appropriate environment to support and motivate project managers because this can take away the negative effect brought by previous project failure. Boss: Dev, I need you to come with me to a meeting..
Dev: Excuse me Boss! What is this meeting about? Dev: Sorry, I didn’t get that. Boss: I am not sure about it myself. I think there will be a discussion on marketing strategies for the new product launch. Dev: Err Boss, but I am a technical person and I know nothing about marketing. Boss: Oh, don’t worry about that. I want you there just in case they ask some technical questions. I need you to field those queries. Got it! Now just come along. Dev (thinking): Someone wants to look good in the meeting. But what about me? Hope I don’t look like I have lost my way in the meeting room. 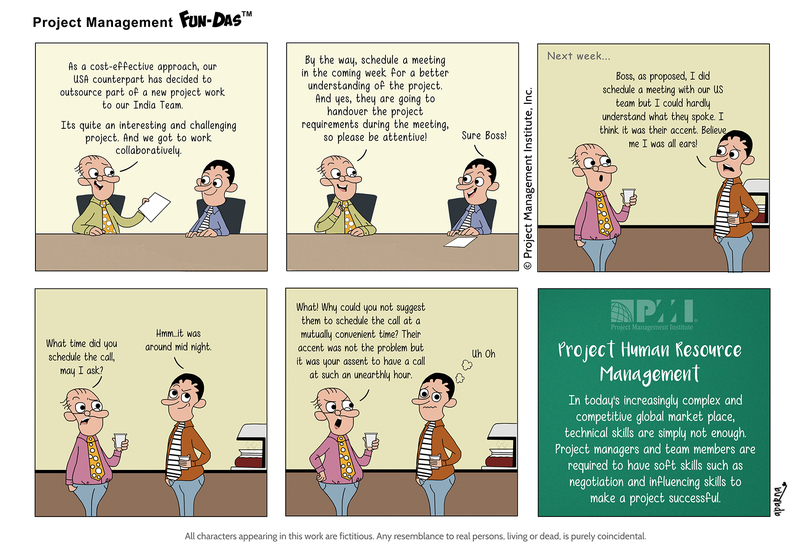 Most project meetings are for the purpose of resolving problems or making decisions. To have purposeful meetings, they need to begin with a defined list of issues to be discussed, which are circulated in advance to appropriate stakeholders with minutes and other information documented specifically for the meeting. Boss: Dev, as you are aware, we have bagged a new project which requires developers with JAVA expertise. I understand we don’t have enough resources with those skills. Is that right? Boss: So as the project manager, I suggest you take the responsibility of hiring the best resources available in the industry. Just remember that this project will start in two weeks from now, so start looking right away! Dev: Boss, I have finally managed to put together the best resources for our new project that too at a short notice. And..
Boss: Oh, didn’t I tell you? Our client has changed the entire project technology strategy. We do not require JAVA professionals now. Dev: What? We had put in so much hardwork to get the best people on board in limited time. Now what do I do with them? Boss: Dev, you worry too much on small issues. We will figure out later. Now you focus on the current requirements. Project managers spend most of their time communicating with team members and other project stakeholders. Effective communication creates a bridge between diverse stakeholders who may have different perspectives and interests, which impact or have an influence upon the project execution or outcome. Boss: Mr.Dev…you skipped yet another important project meeting today. Your presence as Senior Tech.Lead was much required there. Senior Tech.Lead: What? Which meeting? No one informed me about it. Boss: I had sent an email to all concerned more than a week back so that there is ample time for preparation. Senior Tech.Lead: Email? I have not received any email regards this meeting. Boss: I had also marked it as “Urgent meeting” so it is not missed out. Senior Tech.Lead: Oh ok! Now I understand. Well, you see, I receive umpteen number of emails with “Urgent” in the subject line every day. It is never easy to figure out which is truly urgent and needs action. Senior Tech.Lead: Next time if there is anything really urgent, I recommend that you inform me personally as well. I won’t miss it that way. Plan Communications Management is the process of developing an appropriate approach and plan for project communications based on stakeholder’s needs and requirements, and available organization assets. The key benefit is that it identifies and documents the approach to communicate most effectively and efficiently with stakeholders. Project Manager: Jay, the project team has been waiting for you to deliver the few lines of code since last two weeks. 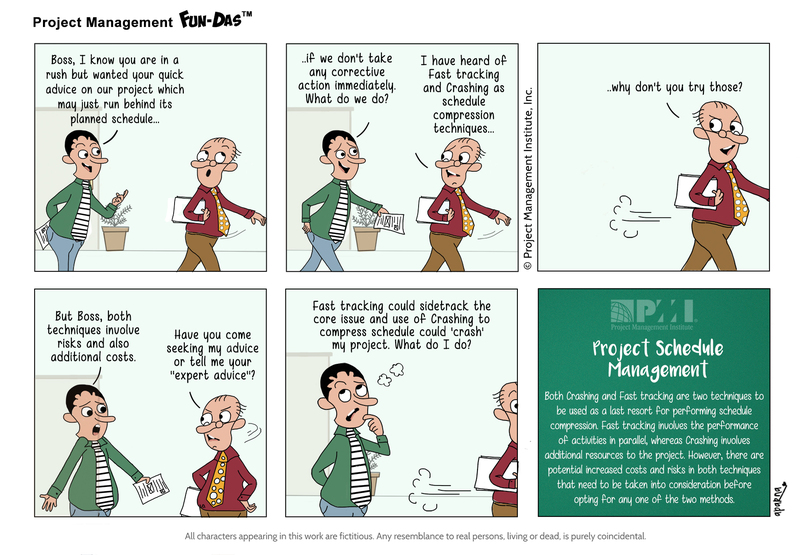 Project Manager: Why is it taking so long? The project is getting delayed because of your procrastination. Project Manager: Just put an extra bit of urgency in your work and ensure you get it done by the end of the day. Senior Tech.Lead: There is a saying,”Patience is a virtue” and also best things in life are worth waiting, you see! Project Manager: Huh, best things in life?? Senior Tech.Lead: Yeah, like me and my work! Slurp! Dependency analysis is a technique used to analyze the dependencies between activities. A dependency exists whenever the outcome of an activity or the occurrence of an event influences the execution of another activity. An examination of the dependencies helps structure the process model. 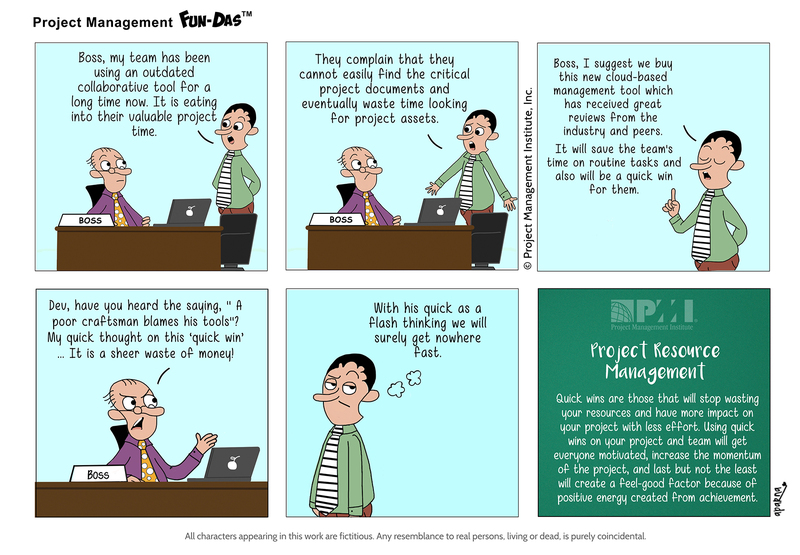 Boss: Our project is six weeks behind schedule…you have to do something to get it back on track. Boss: so till the issues get ironed out, this office is your home and your team is your family! I shall check on the project status exactly after three weeks from now …OK? Boss: Gaaah, what happened? You look like a hit and run victim. Employee: You can say that again! I have been attempting project crashing to get the project on track. Employee: This is the effect of overtime, somehow bringing in additional resources, and last minute coordination. Crashing is a schedule compression technique used to shorten the schedule duration by adding resources and without reducing the project scope. Crashing works only for activities on the critical path where additional resources will shorten the activity’s duration. Project Manager: Team, I have some news for you. Our new product was launched successfully on time and within specified budget. So kudos to the project team! 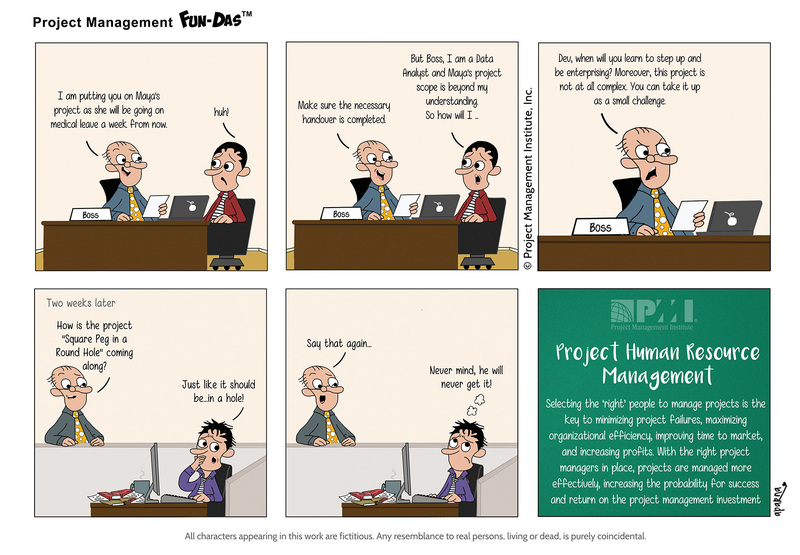 Project Manager: Hold on… Hold on!! I’m not done with the news yet! That was the good news. Now brace your heart for some bad news. Project Manager: The client has said that the project objectives are no longer in tune with the overall business strategy of the organization. 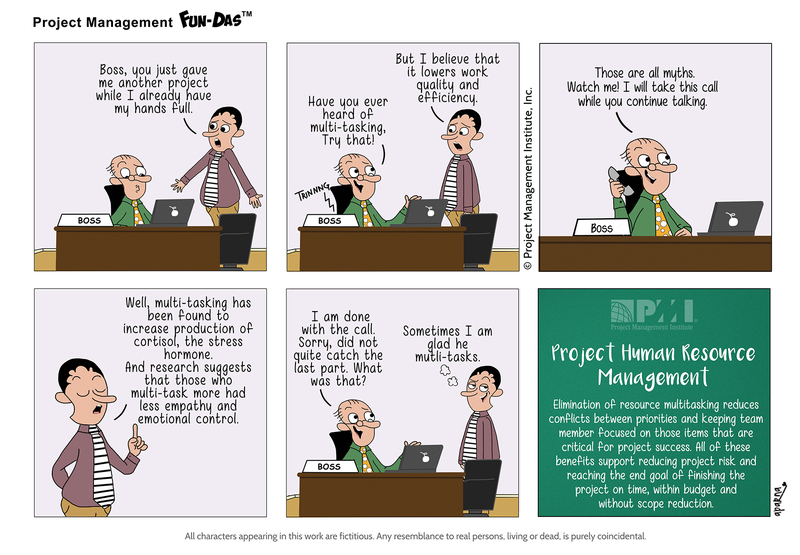 Project Manager: ..and hence the project outcomes will not be of any benefit to the company. Team mate 2 (thinking): I hope “our benefits” do not get affected due to the same. It can be defined as the processes and practices for identifying benefits and aligning them with formal strategy. Through BRM, organizations can ensure that project and program benefits are realized and sustained. Boss: Are we all set for the launch of the new website, tomorrow? Boss: Good! But make sure there are no unexpected problems cropping up at the last moment! 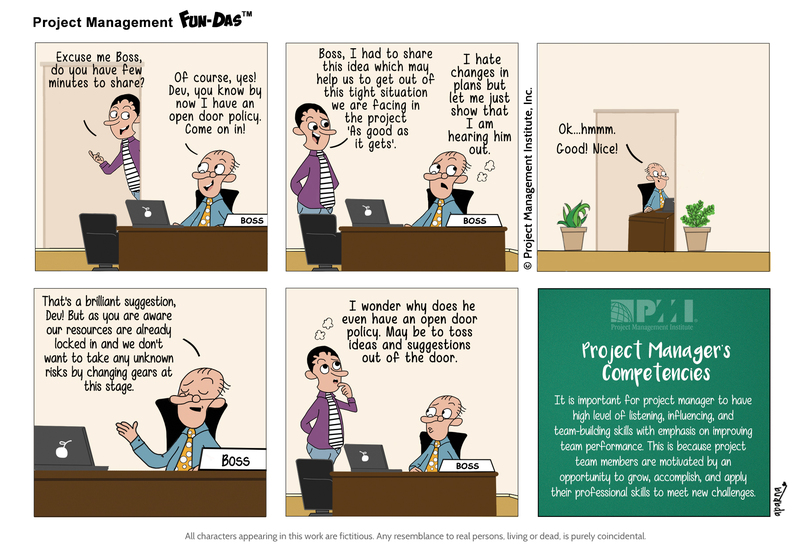 Project Manager: Yes Boss! Don’t worry! All that is taken care of. Boss: Our server has crashed. Our network is down… The website launch has been thwarted…the client is bombarding me with incessant calls! Can you please explain! 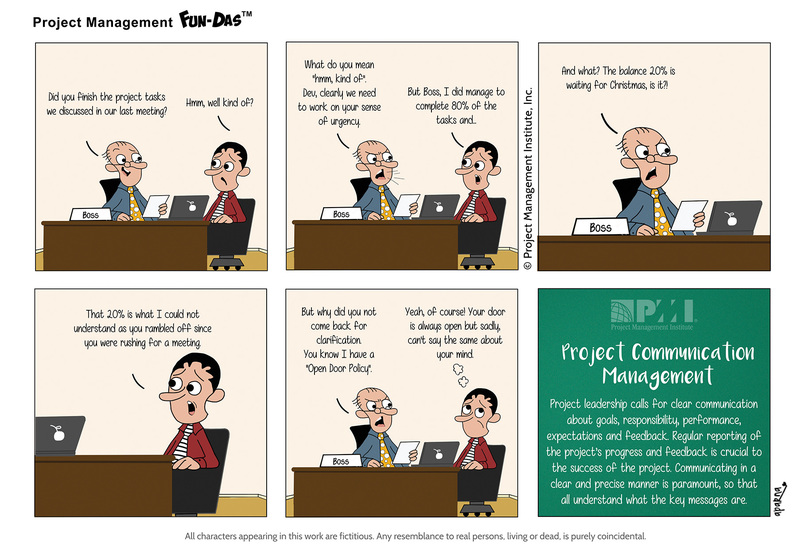 Project Manager: Oh! It could be the power outage!. Boss: What!!! If you remember, I had clearly told you to take care of these problems beforehand. Project Manager: But you asked me to take care of ‘Unexpected’ problems..while this one was a Scheduled Outage carried out for some routine maintenance. Project risk is an uncertain event or condition that, if it occurs, has a positive or negative effect on one or more project objectives. Known risks are those that have been identified and analyzed, making it possible to plan resources for those risks. Known risks that cannot be managed proactively, should be assigned a contingency reserve. Boss: How did your client meeting go? Project Manager: I suggested that we should add some more awesome features and make it more useful. Boss: Why on earth did you do that? Boss: Of course…it has made an impact but only on our timelines and budget! 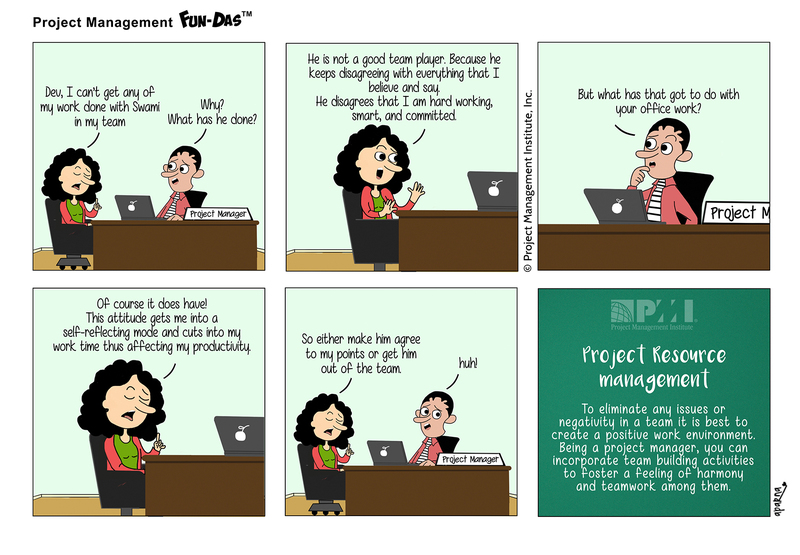 Project Manager (thinking): Bad decision! I guess! Gold Plating is giving the customer something that he did not ask for, not part of the project scope, often something that the client may not want and possibly even beyond what is practical or reasonable for the effort. Boss: Team…as you are aware, our project went live yesterday successfully. Kudos to all! But it’s not all over yet. We still need to provide project support for the next six weeks. Boss: I want you all to work full steam and provide required technical support at all times without any breaks. Team mate 1: Sure, you can depend on us for that! Client: Hello! I can’t seem to log-in to the application. It is giving error messages. Night Watchman: I don’t seem to see any problem with the application…the problem must be…ahem! Your technical ignorance… maybe. Client: WHAAT! Are you out of your mind! Who am I speaking to, by the way! Night Watchman: I am the night watchman. I am handling the calls till the support team is back from their break. Human Resource Planning is used to determine and identify human resources with the necessary skills required for project success. Effective planning should consider and plan for the availability of or competition for scarce resources. Client: Your organization is known in the industry for being customer-focused and adaptable. As clients we are highly impressed! Boss: And I am flattered, thank you! Client: So on that note, here are a few features I want you to add in the application. Boss (thinking): That’s something outside the project scope… but not doing so will taint our “customer focused” image. Boss: How is the new project coming along? Project Manager: It is going as per plan. Thankfully, no delays so far. Boss: That’s great! Here are some additional features which the client wants to be added to the application. Project Manager: But we cannot deliver the project on time if the customer adds features which are not part of the scope. Boss: Stop the excuses. We are known in the industry as being customer-focused. Do not forget that! Project Manager (thinking): What happens to the focus which my team may lose because of this scope creep. Scope creep is one of the most devious problems commonly faced by project managers. To avoid it, clear and well-managed scope is a key element to successful projects. If the product scope and its requirements are not clear and specific, it is a ‘breeding ground’ for scope creep. Boss: Dev, I have mailed you the Project Plan. Please take a look and send me your inputs. I am sure it won’t take much of your time. Boss: Dev, your help is urgently needed on Project Da Vinci…the team is stuck with a complex coding issue. And yes, I also want you to train the new team members for our project. Be patient with them, they are newbles! Dev: Huh, But Boss..I have..
Boss: Hey Dev! Ravi just called in sick. So now I want you to step in and go for the requirement-gathering meeting on his behalf. And by the way, have you completed the white paper document I had asked you to work on? Boss: Why is your project still not complete? Are you saying nothing has been accomplished in the past few weeks. Dev (thinking): He has conveniently forgotten that I have completed all his sundry urgent tasks, on time. Boss: Can you at least enlist a few significant activities? Dev (thinking): I wish I had recorded all those “outside of my scope” tasks that he was happily dishing out to me while my project suffered. Conflict is inevitable in a project environment. Sources of conflict include scarce resources, scheduling priorities, and personal work styles. Team ground rules, group norms, and solid project management practices, like communication planning and role definition, reduce the amount of conflict. Boss: Psst! Is there some sort of masquerade party in office for which I haven’t been invited to? 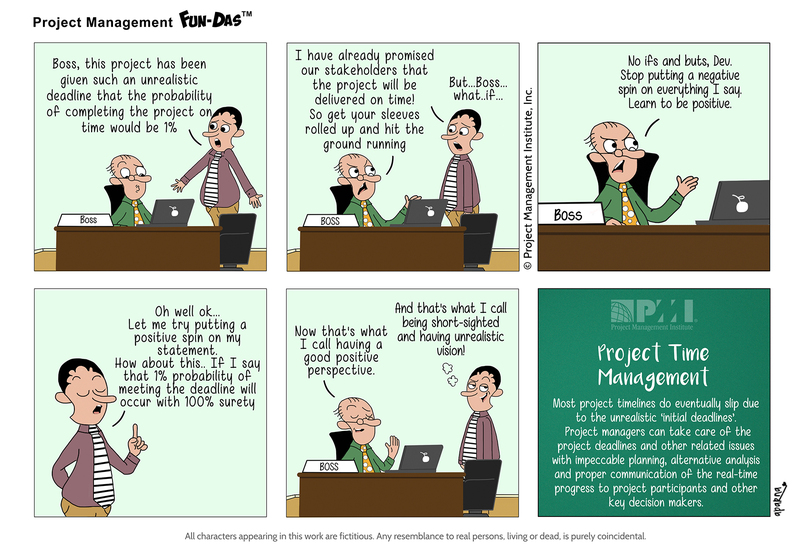 Project Manager: No Boss! Actually, off late, I had noticed lot of conflicts among our team members. It was the main reason for their inefficiency and project delays. Boss: So what’s with the masks I see on their face? Project Manager: To resolve these constant fights and arguments, I came up with this “Conflict Resolution Plan”, which I hope will lead to team harmony and congeniality. The success of project managers in managing their project teams often depends a great deal on their ability to resolve conflict. Successful conflict management results in greater productivity and positive working relationships.